The last two months could be visually portrayed as the slow- motion toppling of a long line of dominos; just as one crisis seemed to be over, the next began, and I’m fed up with feeling overwhelmed! I would love to just freeze-frame my life, take time for myself to regroup, then come back and count my blessings. They call this notion holidays, I believe – not a concept that is very familiar to lone parents such as myself, but a great idea in principle. Daydreaming while knitting is the closest I’ve been able to get, but is doesn’t last long enough (a fortnight would be favourite…). Ah well, sure it could be worse. Oh Lord, I’m turning into my mother- I always wanted to scream when she trotted that one out, and I’m very sorry for all the starving babies in Africa, and I know I have the use of my eyes and limbs, and haven’t been run over by a bus or kidnapped by white slavers or whatever, but is it so self-indulgent to wish for a bit of good luck? For that generation of Irish Mammies, it was- or at least, saying it out loud was close to jinxing yourself entirely (you never knew when Himself Upstairs might be listening in and give you a clip around the ear for ingratitude, if The Mammy hadn’t already done it for Him). 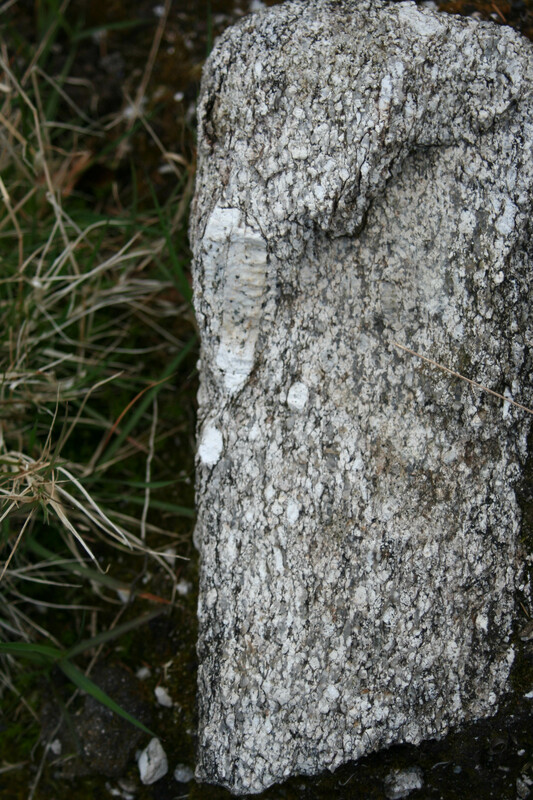 Mind you, every now and again, a ray of sunshine/hope has been piercing the clouds: GF had an appointment with a mining company in south Wicklow (south of Dublin, on the western side of the Leinster Granite/mountains), so I was invited along on another mineral and yarn expedition a couple of days ago. 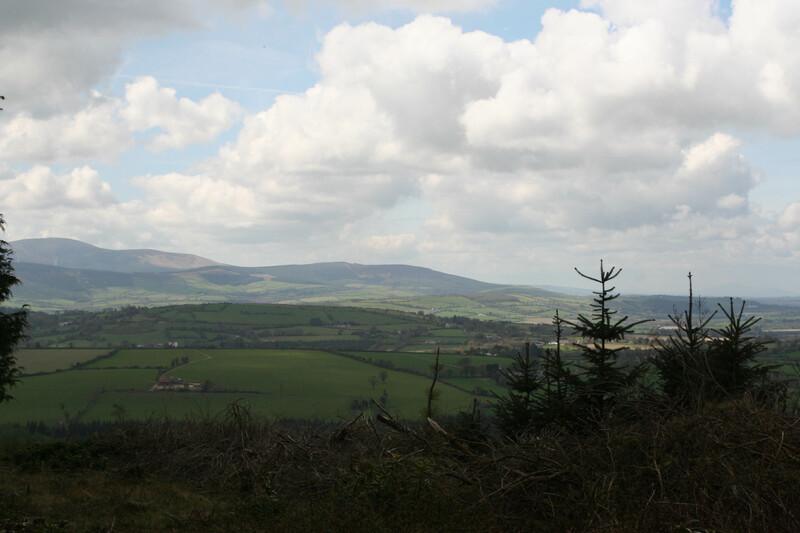 It was great: away from the city into peaceful countryside which, as you can see, is not particularly exciting or photogenic, but full of undulating green calmness. Very soothing, I loved it, especially as all sorts of buds and blooms were just unfurling- really late, thanks to the harsh late winter we’ve had (see, the whole country is miserable, I think it’s catching…). 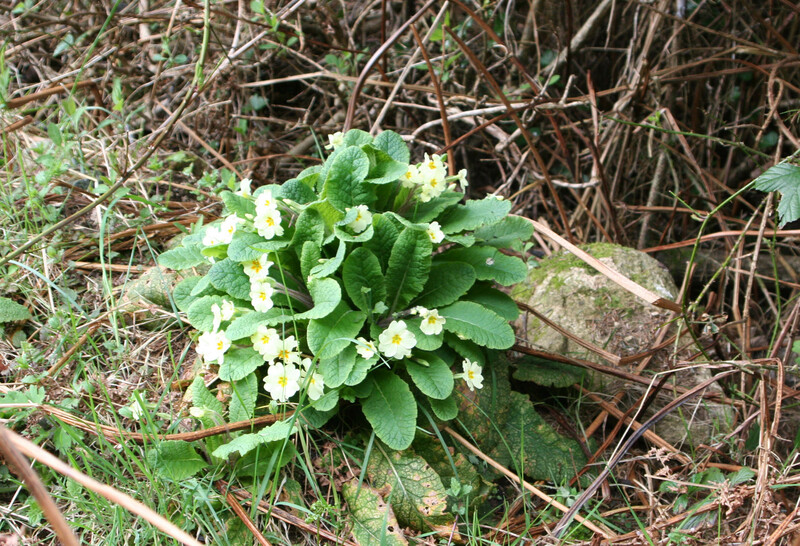 Primroses in May! Believe me, that’s unusual. Aren’t they lovely, though? I felt myself smiling right back at them, the brave little dotes. 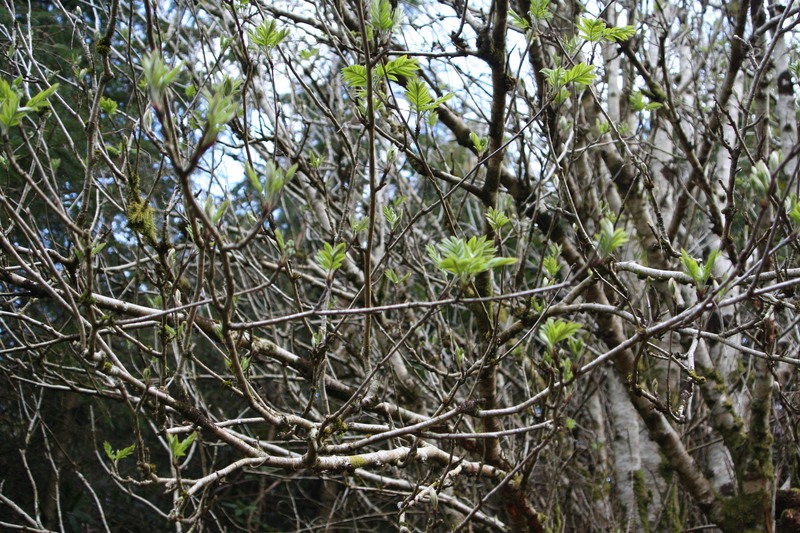 And the trees are recovering too, three cheers! 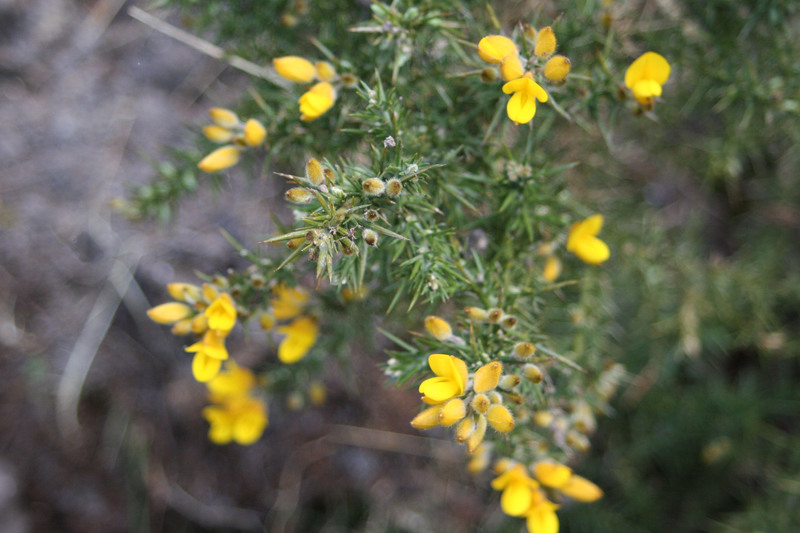 Even the scary gorse is looking lovely at the moment, though childhood trauma prevents me from getting too close…. And how do you like my latest “this is the house I want when I grow up”? 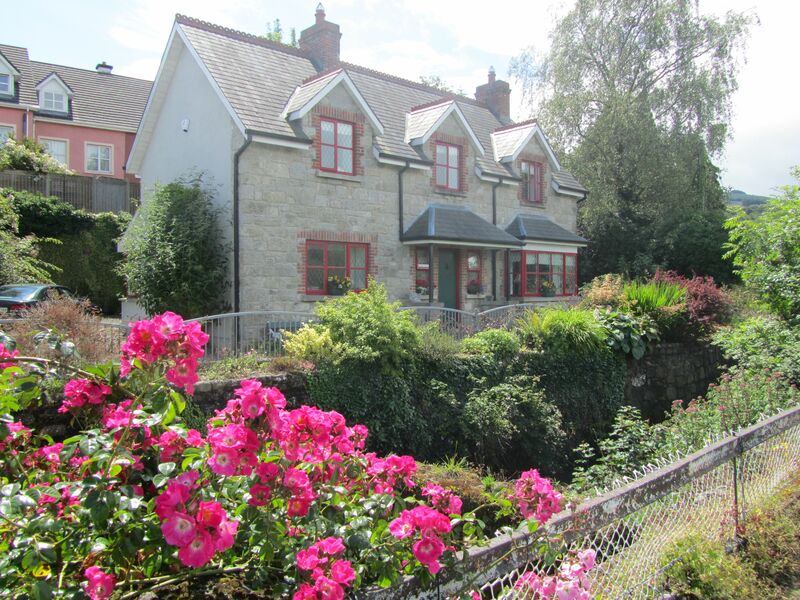 It’s built of the local granite and looks so snug…. 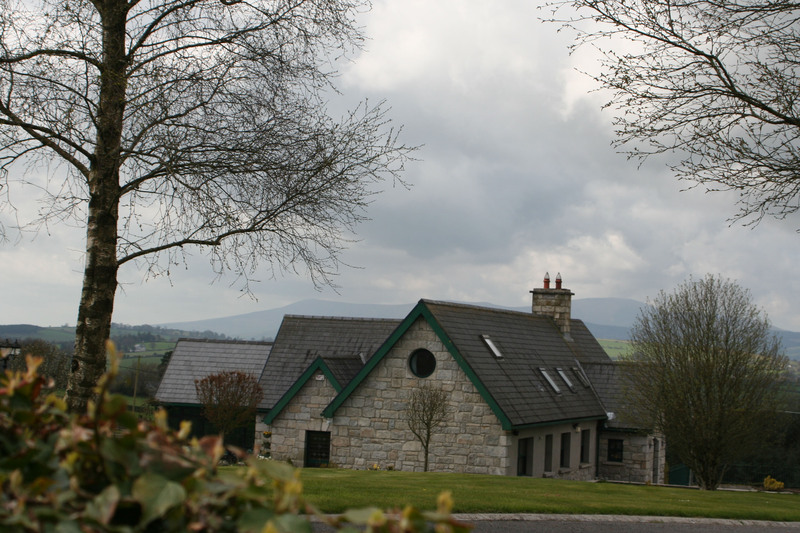 A lot of the houses that were built down the country during the Celtic Tiger, when quite a few people suddenly had a lot more money than sense, are huge, pretentious, tasteless monstrosities, but this one gets my seal of approval. 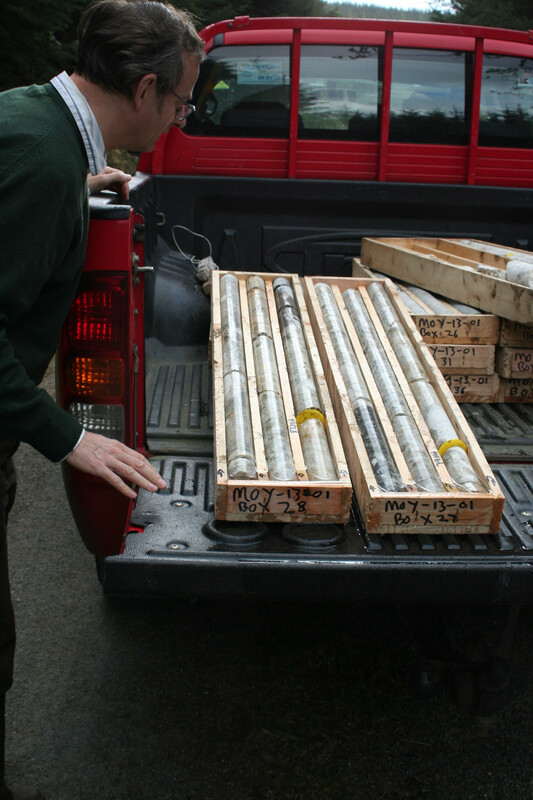 It’s right beside the swath of national forest where we were to have a look at the drill site and local geology- the couple of lumps of bedrock that aren’t covered by said pine forest. 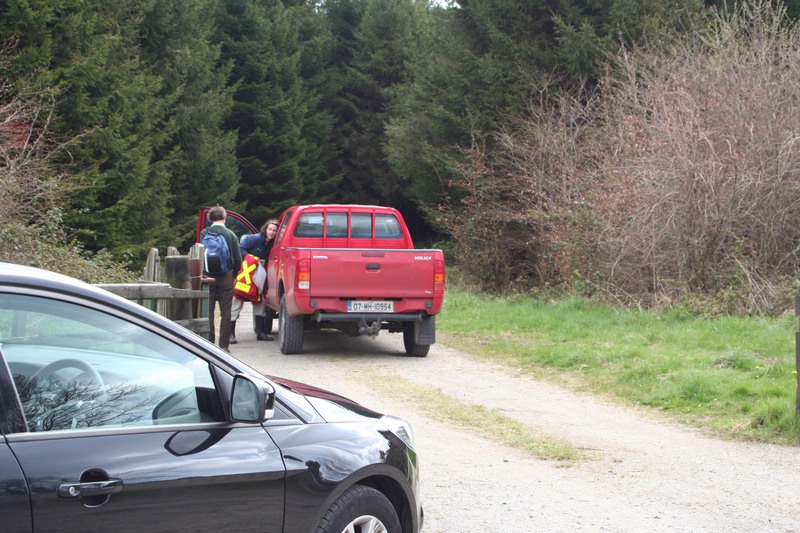 Our colleague L collected us at the gate, as of course we weren’t allowed to drive in, and off we went. I should mention that unfortunately in Ireland “national forest” almost invariably translates as “pine monoculture”, as biodiversity was an almost unknown concept when the State finally started its reafforestation projects (back in the 60’s and 70’s, I think), the original oak-ash-mixed deciduous forests which blanketed Ireland having been cut down by the English to a) build ships for the Royal Navy and b) flush out the rebels hiding in them (think Sherwood Forest times 100, without any Hollywood actors prancing around in tights). So now we have huge areas of depressingly dark and boring scratchy pines, brr! No outlaws though (those pine needles are murder on tights). If you’ve ever been to the Black Forest in Germany, you’ll know what it’s like: they have to carve lumps out of the forest so that you can see the view, otherwise you wouldn’t know whether you’re on a hill or in a valley, the visibility is so poor. 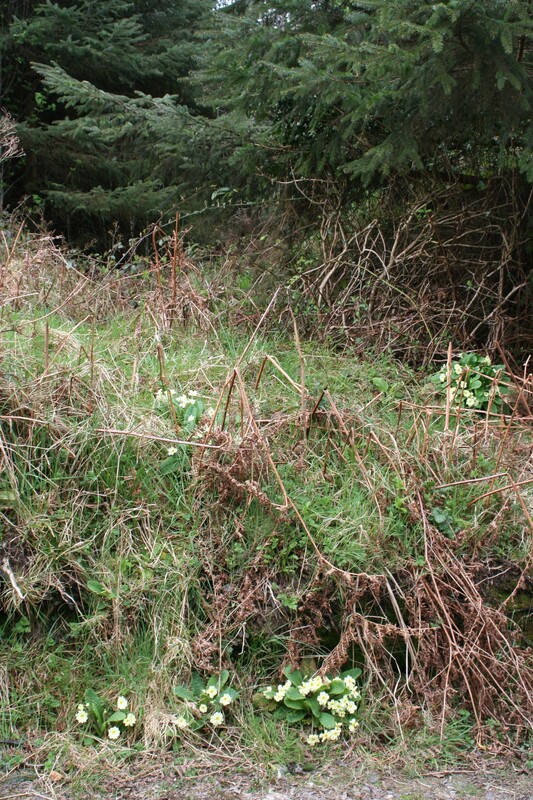 Luckily for all concerned, this part of the forest had already been designated a “regeneration area”, where a genuine forest is to be allowed to develop, even if it does take a couple of hundred years. In other words, it had already been felled, so the mining company is not causing environmental damage (they’re not always bad guys, you know, even though no-one wants them in their backyard). 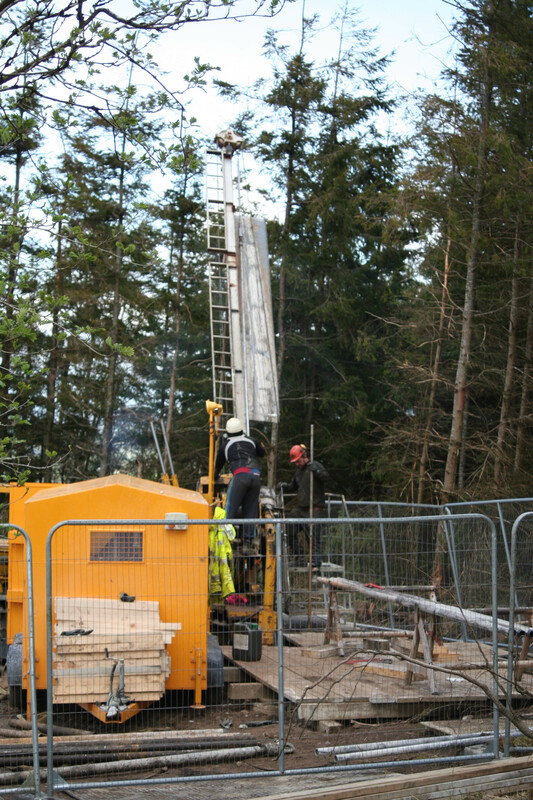 The actual drillsite is pretty small. 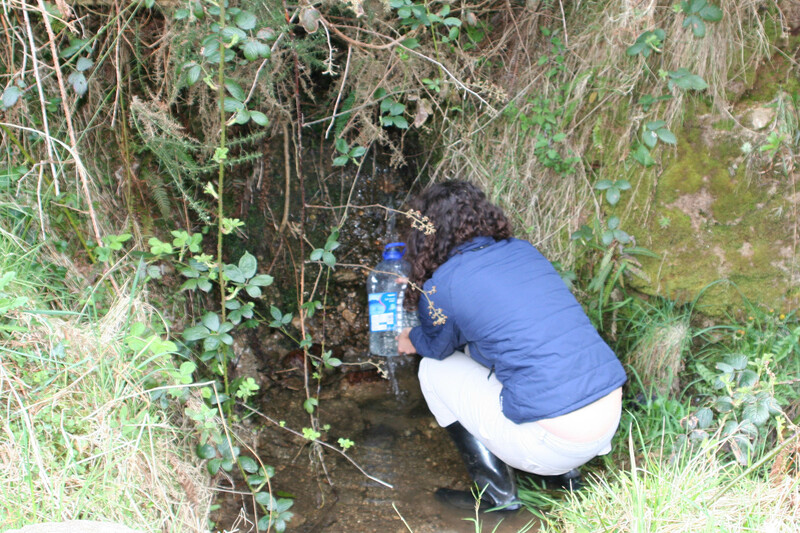 Collecting water from a stream, so we can look at the core samples- they’re easiest to see properly when wet. 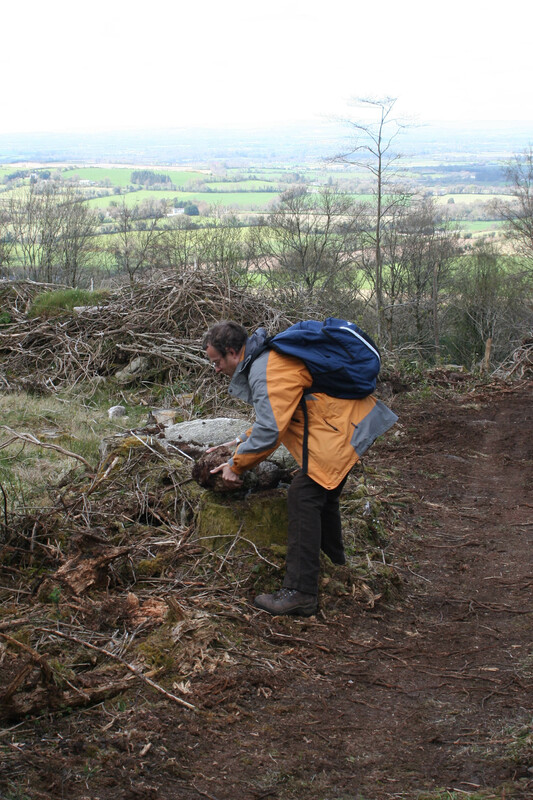 Inspecting the sticks of rock, aka core. 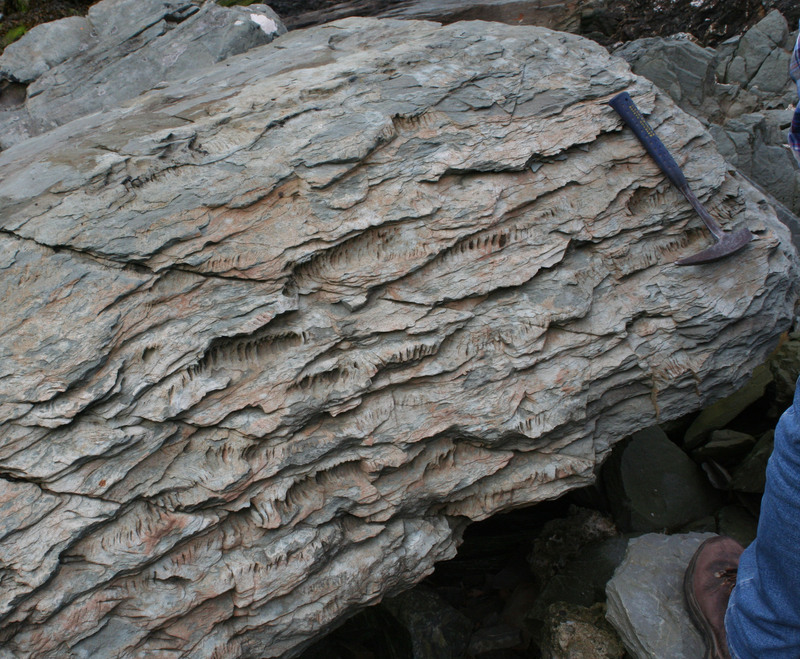 Major shearzone-related deformation has affected these rocks, and presumably the way the valuable minerals have been deposited- the thin sections will be beautiful! Now I’m in complete nerd-mode, but the graphic texture at the top of this photo fascinates me, and it’s going to turn into a great knitting pattern, I can feel it wriggling in my subconscious (in a nice way)! And for those who like their minerals extra sparkly, here’s some muscovite mica. 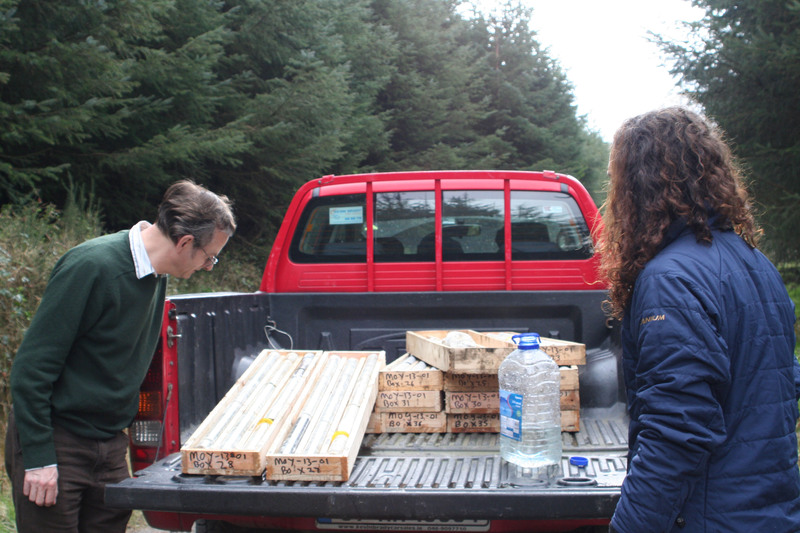 And finally, some happy geologists in their natural habitat! But what about the yarny part of the expedition, you (patiently) ask? Well, I had planned to explore The Yarn Room in Ashford, and do you a report, because I’d heard great things about it, but they’ve gone online only, to my disappointment, so as a default option we dropped in to see Aimee Rose in the City West Shopping Centre. It has expanded hugely since the only time I was there (ca. 2 years ago), when I discovered Midara yarns from Lithuania (remember the magenta shawl for DS’ graduation?). Well, I love to hear of a yarn shop doing so well, when the entire country seems to be groaning under the recession, so I had high hopes. 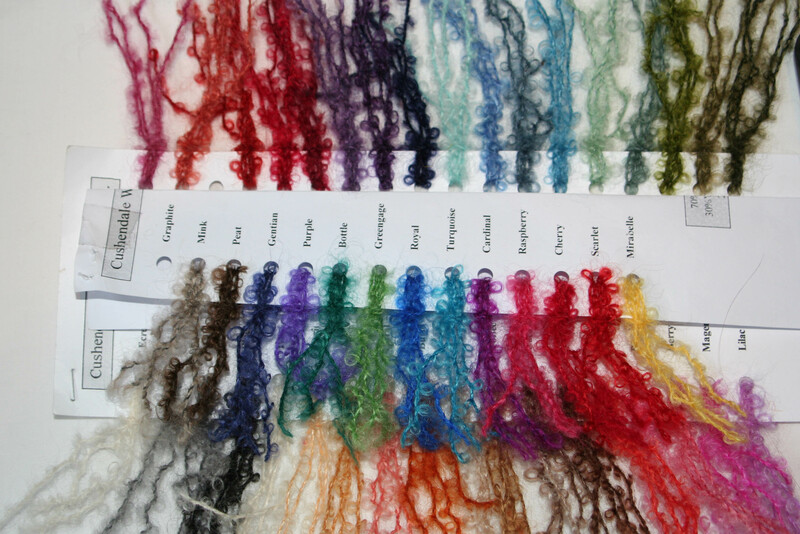 However, almost all the yarns were synthetic or at best blends with up to 20% natural fibres, because apparently that’s what is selling in the current financial climate, though not to me. Even the very inexpensive yet natural Midara range is not stocked regularly any more (and now I don’t know where else to find it! ), but there is a happy ending. A few balls were tucked away and almost forgotten in a far corner, until I liberated them. “Happy Shiny Cotton”- how could I resist, even if the colours weren’t so pretty? It might just as well have been labelled “Cheer Up Pauline”! 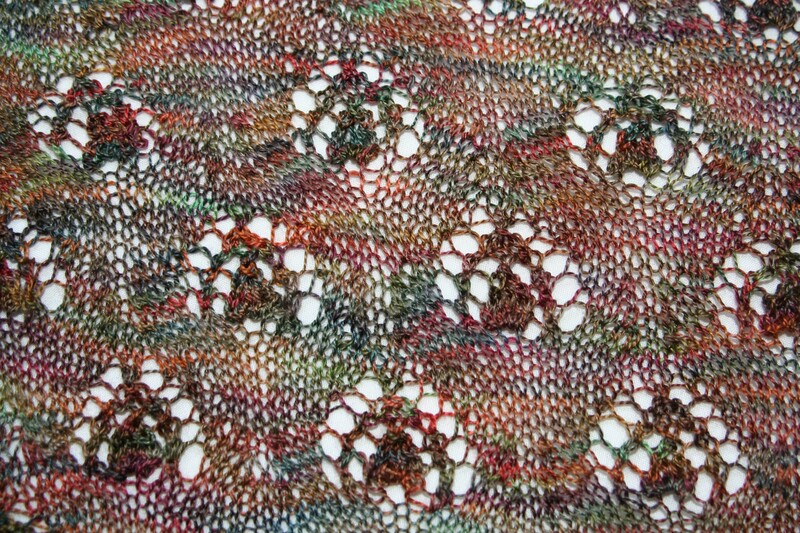 We are now engaged in creating my variation on Marianne Isager’s Waves summer top, from her excellent book “Classic Knits”- this is one of the first knitting books I ever bought myself, and I love it. Knitting therapy is working, can you tell? 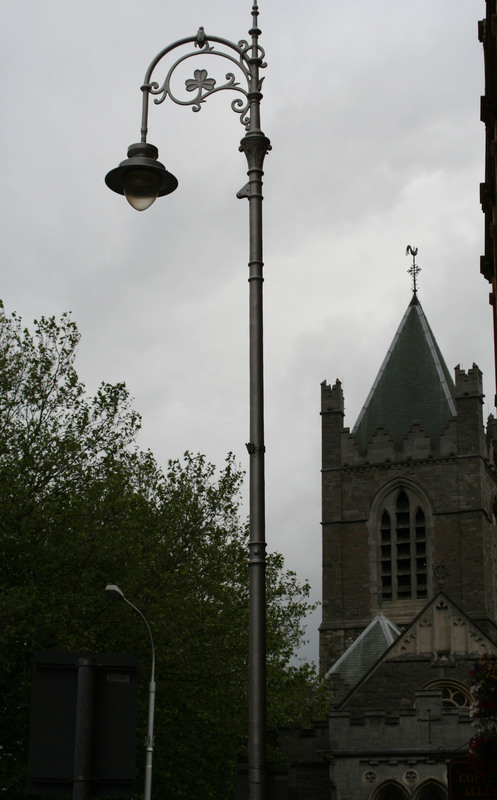 Thanks to my war wounds, I haven’t been gallivanting much recently, but my DS was showing a friend from his UCD Kung Fu club some of the sights of Dublin, and kindly volunteered to provide some photos so we can all enjoy the view vicariously. As she’s from Madagascar (now there’s another place on my must-visit list! 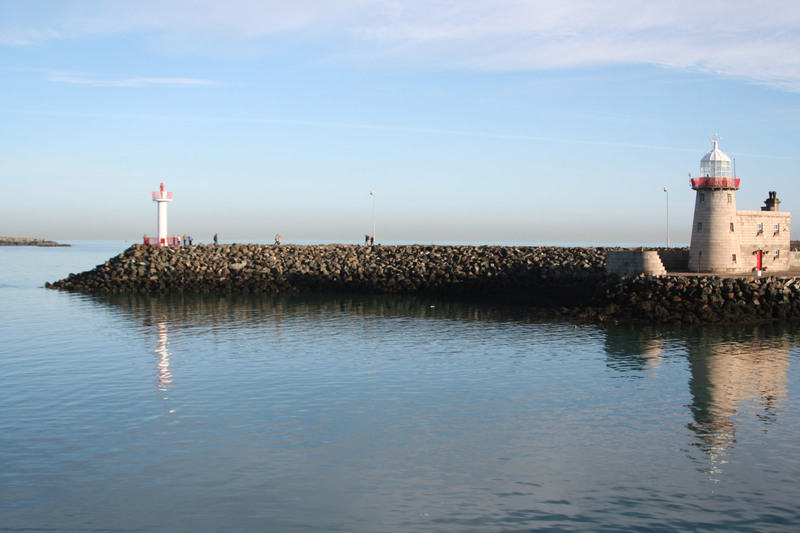 ), the fishing village of Howth, now part of Dublin’s Northside, seemed like a good contrast. 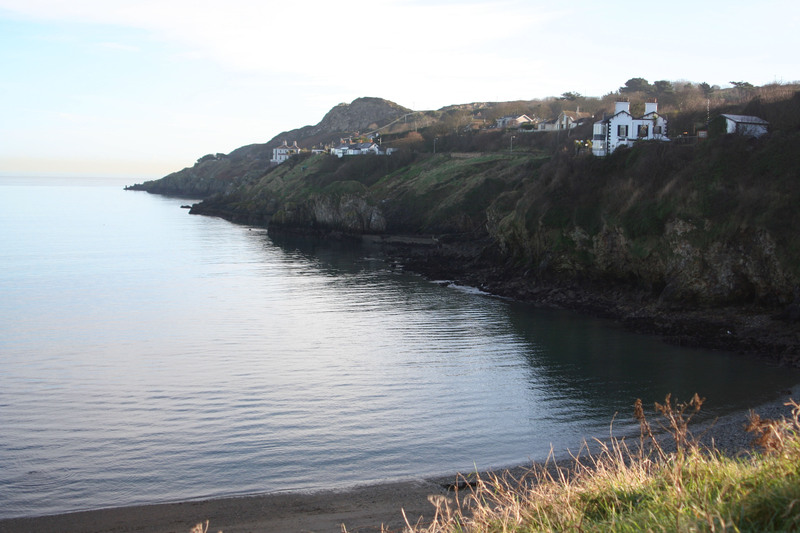 Howth village and harbour (on the left, looking north) are situated on a flat isthmus of Carboniferous sediments, which end abruptly at a fault zone, with a steep hill of intensely deformed and much older quartzites on the other side of the fault. Because they are much harder they form the high ground. The island in the background is called Ireland’s Eye, and is also formed of the same tough rocks of almost pure quartz which have been tempered at high pressure and temperature like a samurai sword, wiping out evidence of their exact age and origin- very mysterious, but picturesque! 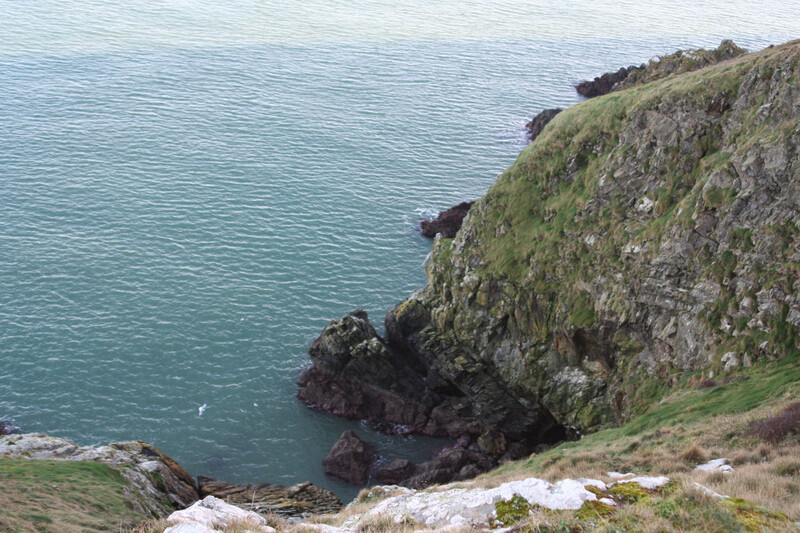 Howth beach formed on the weak fault zone, and the cliffs of Howth Head rise steeply on the far side of it. 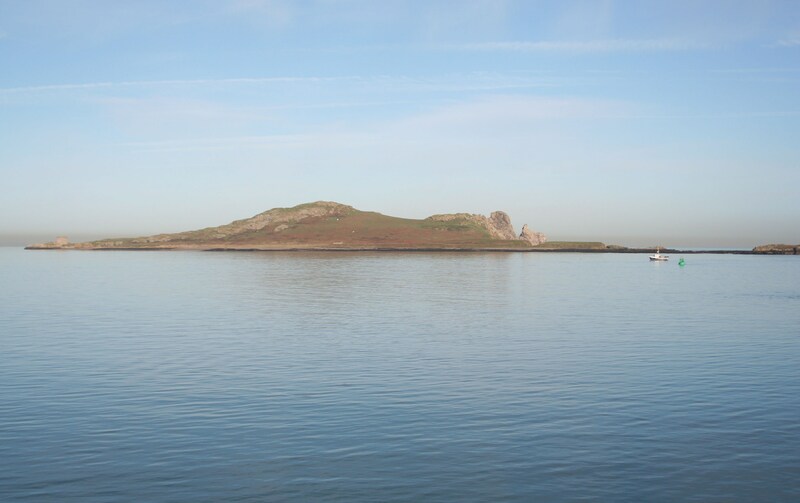 This is a truly lovely route for a walk, all around the Howth coast in an almost complete circle. 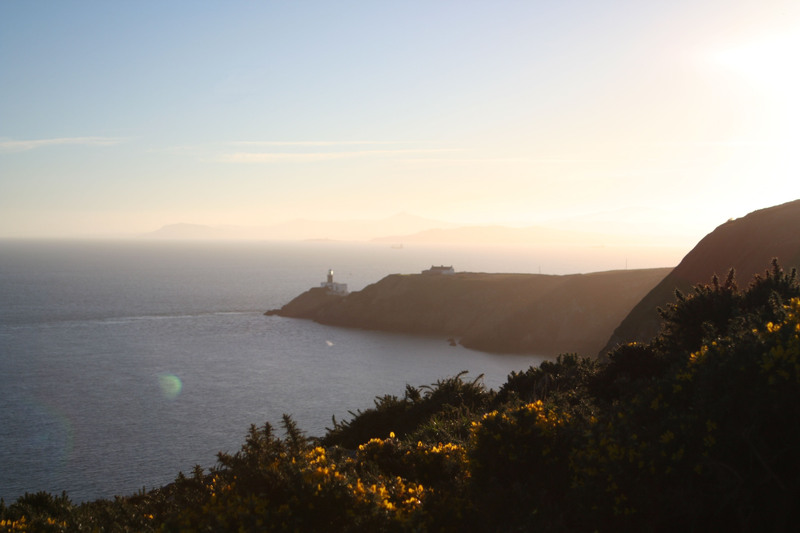 Looking south from Howth Head, past the lighthouse, we can see the Wicklow mountains (Leinster Granite) in the distance, across Dublin Bay. 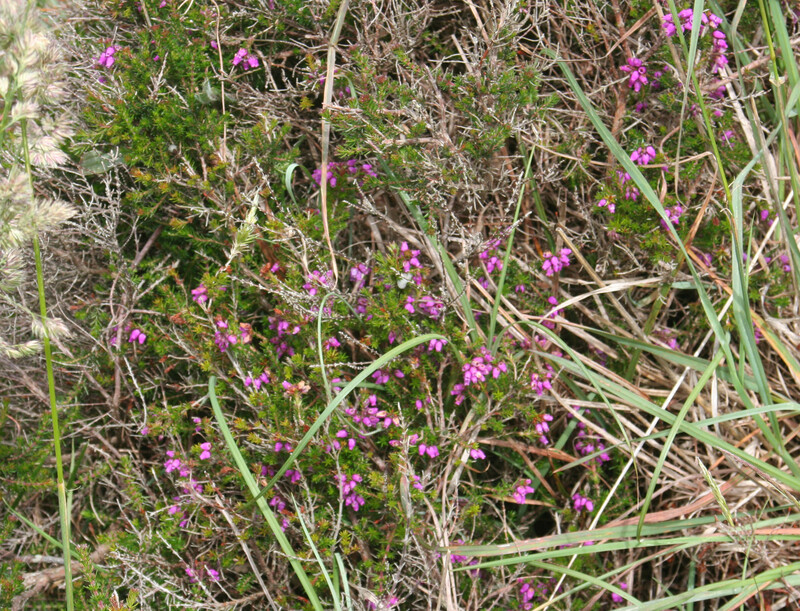 The furze is indeed that intense golden colour in real life, but so thorny that it’s best enjoyed at a safe difference…. Howth Harbour is worth a closer look, not only because it’s pretty, but also because the best of the catch is on sale in a row of specialist shops at the landward end, and some of the best fish’n’chips ever. 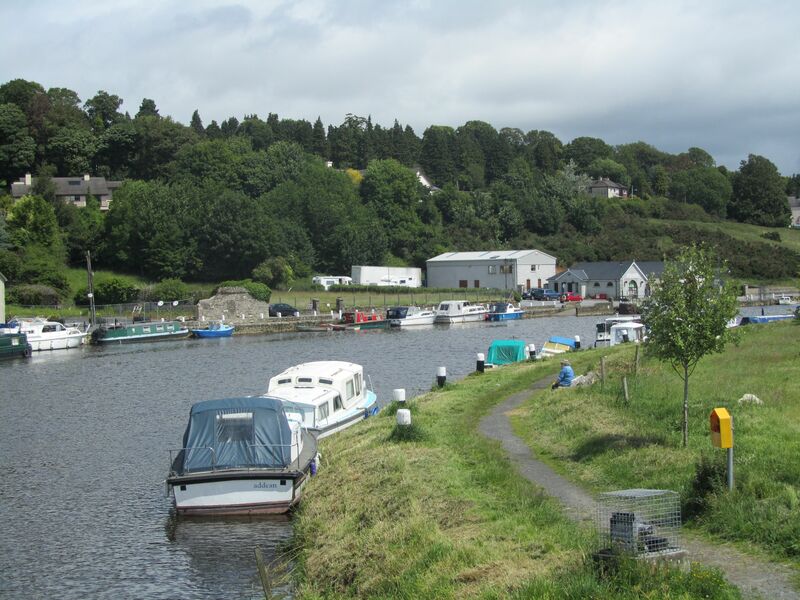 This harbour was meant to be much busier, but unfortunately the tricky counter-clockwise currents of the Irish Sea caused it to silt up to such an extent that only small craft can use it. 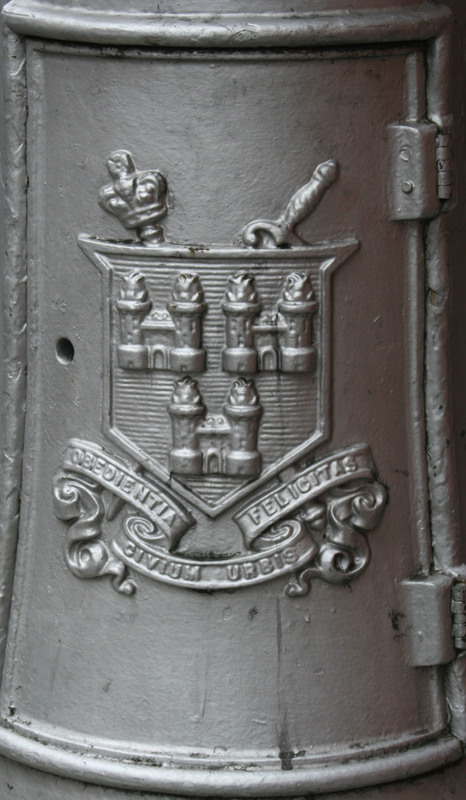 So the atmosphere remains cosy and somewhat parochial, while international shipping business is conducted at Dublin Docks and further south in Dun Laoghaire (Dunleary for English speakers). Thank you, DS, I think that’s captured the atmosphere of the harbour! What have I been up to? Well, it’s been a quiet week, complicated by a headcold and the on-going saga of getting hot water restored, but I am delighted to report that this week’s session in the school went much better than the previous week- the new selection of kids actually sat down, stopped talking long enough to listen and promptly learned to knit! One of the Mammies came in to help, and having a second adult to demonstrate on a one-to-one basis made a big difference. That same evening there was a large influx of newbies to the library group, so even though I didn’t get any knitting done myself, I felt that the teaching was really fulfilling. Now I just need to find a paying gig- the cost of living has soared again this month, while my income remains static….. Still, I’m working on a couple of ideas, now that my back is getting a bit better. 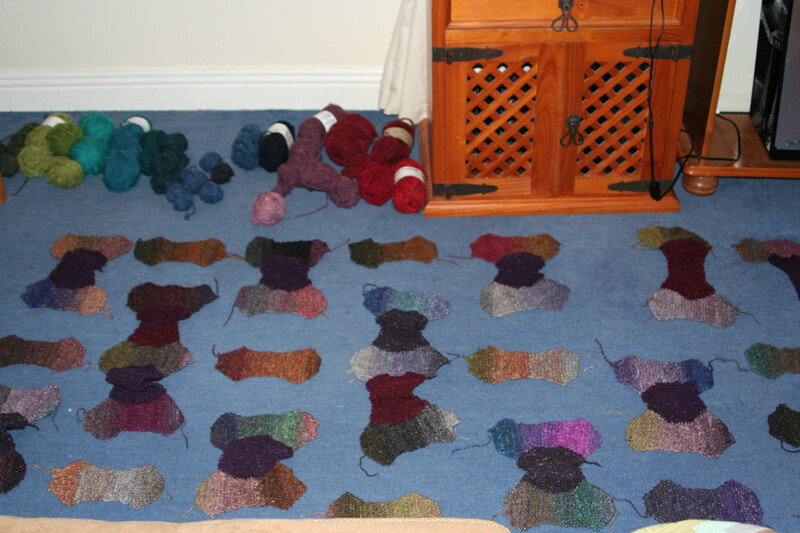 I used up my Noro bargain stash (a total of 400g in assorted worsted weights, on 5mm needles, made 50 patches). 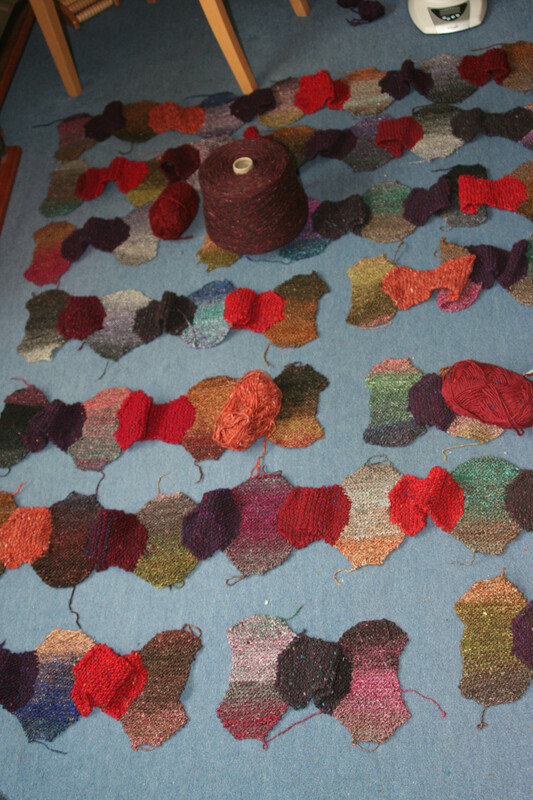 Once I’d arranged them on the carpet I started knitting them together with transverse patches in Donegal Tweed (Kilcarra or Donegal Yarns, they’re basically the same). See part of my Donegal tweed stash by the wall? 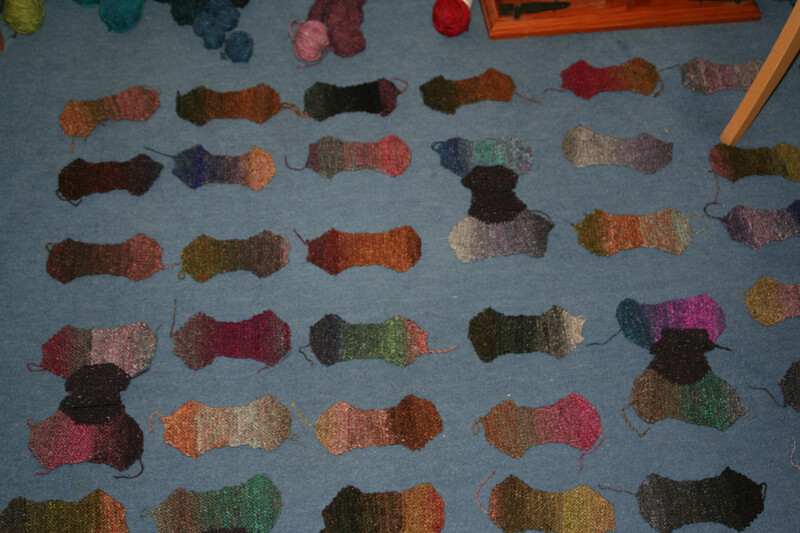 I arranged it in a rainbow- yes I know it’s a lot, but the leftovers have added up over the years, and they keep bringing out rich new colours and it’s inexpensive and how’s a knitter to resist? 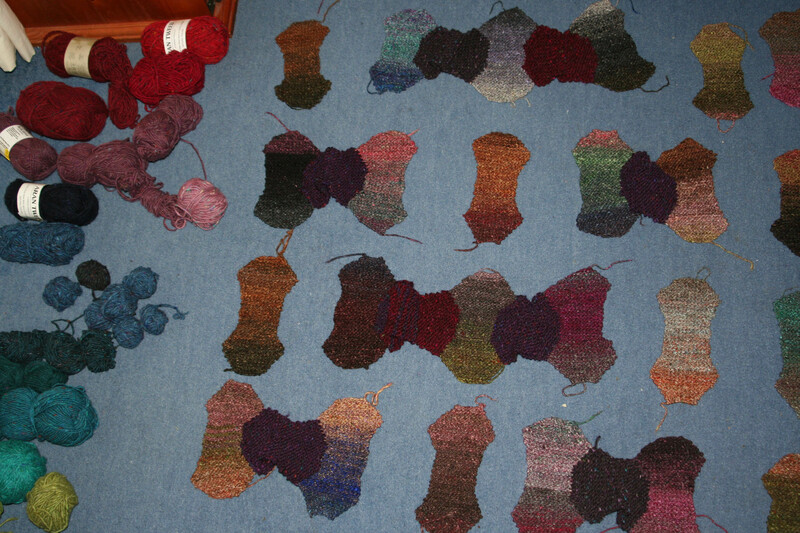 I decided that the purple and red end of the rainbow was a good place to start, and as I was knitting I decided to limit myself to that end of the spectrum and save the blue-greens and neutrals for the inspiration which struck about halfway…(yes, there’s another afghan on the way, this time of my own design). That meant I had to head off through the rain to Springwools, my local tweed supplier, to acquire an orange shade the blanket was demanding. I know I’m not meant to be buying new yarn (my weight is constant, not decreasing), but after all those patches can’t stay on the carpet much longer or they’ll put down roots, and it ‘s just one ball…. …except of course it wasn’t! I picked up my three Euros worth of tweed as required by my Muse, then was ambushed by a goodie-bag on my way to the cash register. There was a time, Springwools would sell off individual oddballs at bargain prices which was dreadfully seductive and led to my stash getting pretty overweight, I must admit. Then they started compiling goodie-bags containing several balls in generally offputting or downright hideous combinations, which were easy to resist and made me feel thoroughly virtuous. 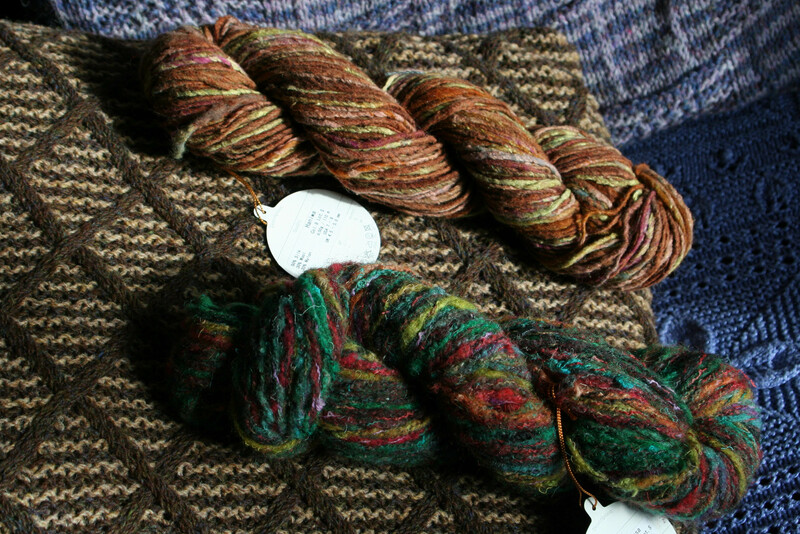 But this week, for the first time I succumbed- two 50g skeins of Noro for 4.95, I ask ye, how could I say no? P.S. do you like the Cushendale cushion covers in the background- that yarn wears really well! There’s my new orange, right in the centre. Before I forget, one 50g ball of aran weight Donegal tweed makes 4 and a half patches 19cm/7.5 in ( long axis). 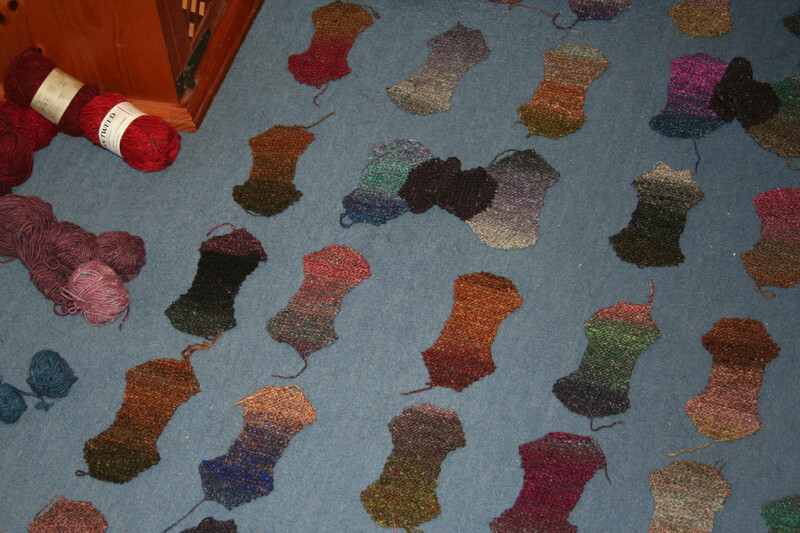 I intend to crochet the strips together now, because it’s high time some vacuum cleaning was done around here…..
Not to mention spring cleaning, no rest for the wicked! Well, since 2012 was , on the whole, pretty much a wash-out thanks to my banjaxed skeleton and general ill-health, I am in arrears with a collection of patterns I wanted to have published by now. So here I am, doing my best to catch up with myself. Note: it’s pure coincidence that it’s January, I haven’t made a resolution or anything. In fact, after reading a selection of published New Year’s Resolutions, all those lists had me so exhausted I felt like crawling into the scratcher and not reappearing until Spring! Me, I’m delighted with myself if I get up-at least once- every day in January (most depressing month of the year, after all), pay my bills and renew my library books punctually. Anything else is icing on the cake. So it is with appropriate pride that I introduce a snuggly unisex scarf/muffler/cowl made from a single ball of Cushendale Boucle Mohair yarn (see Cushendale.ie ). And the pattern is free for your delectation! The idea is to add a dash of colour and warmth to dismal old January, without breaking the bank- cos let’s face it, we’re all broke after December (and if you’re not, give a donation to a charity of your choice!). See, even my DS is smiling, though it’s just as well you couldn’t see the faces I was pulling…. 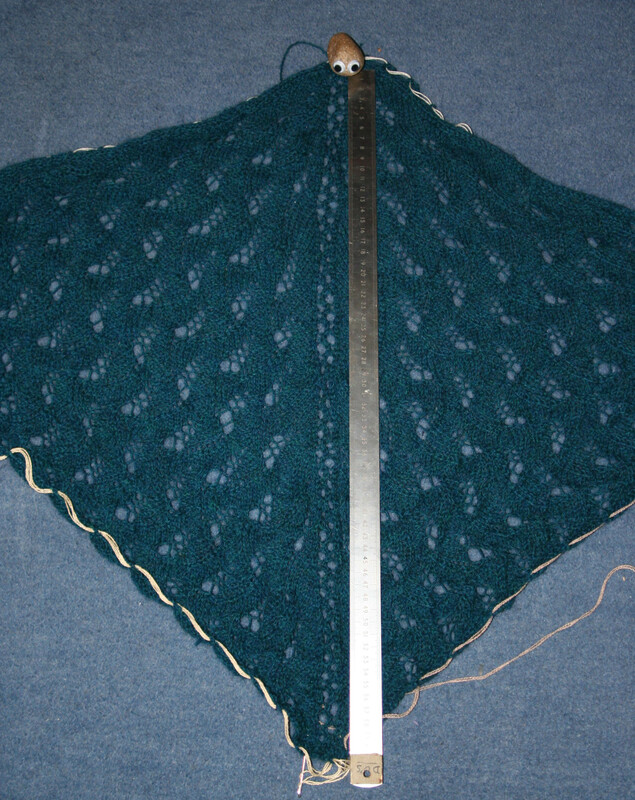 Cast on 35 stitches, using stretchy cast-on such as knitting-on/lace cast-on. Rows 2, 4, 6 and 8: K3, *yo, k3, slip1- k2tog- psso (pass slipped st over), k3, yo, k1; repeat from *, end k3. Rows 10, 12, 14 and 16: K2, k2tog, *k3, yo,k1,yo, k3, sl1-k2tog-psso; repeat from *, end k3, yo, k1, yo, k3, k2tog, k2. Repeat these 16 rows until you’ve run out of yarn ( I had 10 pattern repeats, with enough leftover for a loose cast-off). 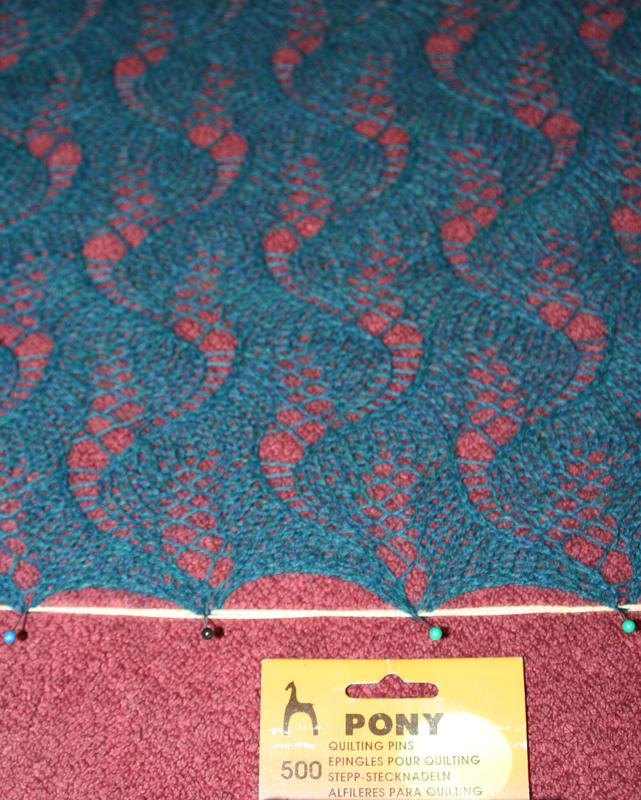 If you want to make a keyhole: work 3 pattern repeats (48 rows). Next row: work 17 sts in pattern, then knit front and back into the next st (an increase of one stitch), which is at the centre of the row. 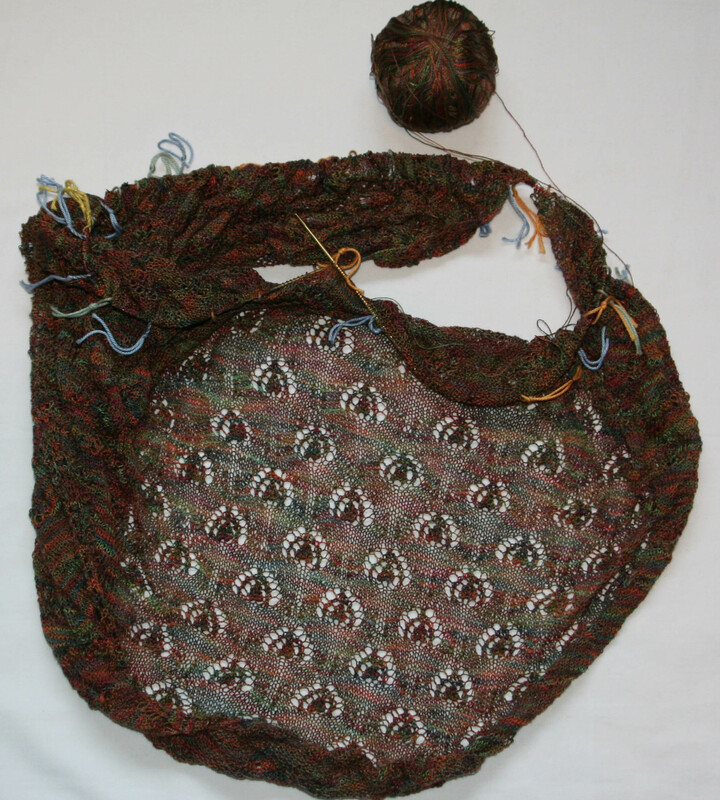 Turn the scarf and work back (19 sts). 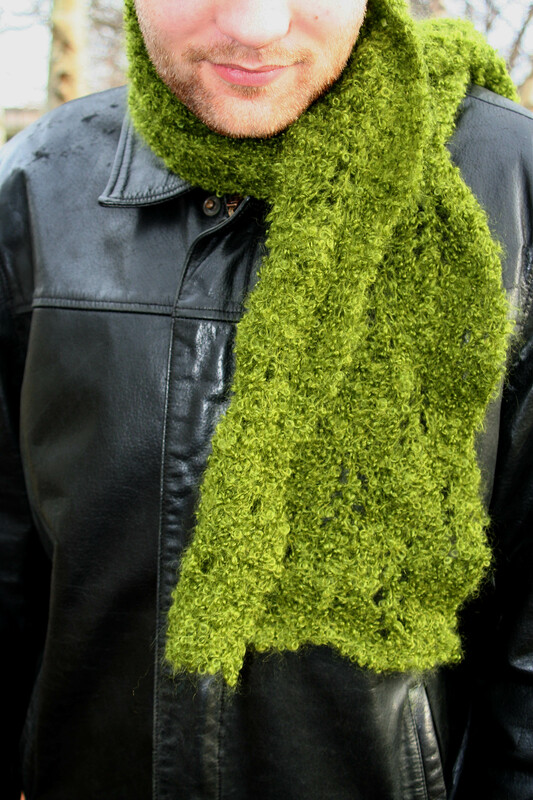 You are about to knit a vertical buttonhole by knitting on half of the scarf sts- just leave the other half waiting on the needle. 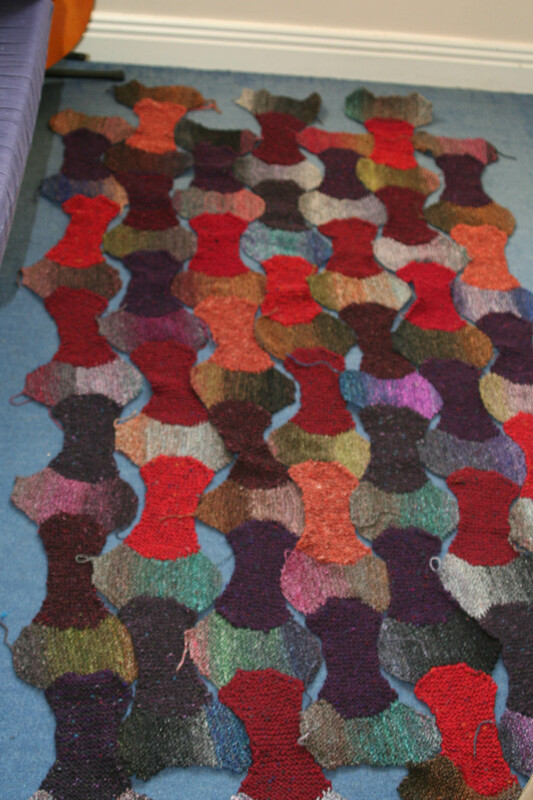 Next row:( you should be starting at the edge of the scarf again) Work 18 sts in patt., and turn (the newly increased st joins the 17sts waiting on the needle). You could place a st marker in the gap between the two sets of 18 sts if it helps remind you to turn in the centre of the scarf. Now complete one patt repeat on the first set of 18 sts. Break the yarn, leaving a tail of 10-15cm for darning in, and rejoin it in the centre to the other set of 18 sts and work one patt repeat on them, too. 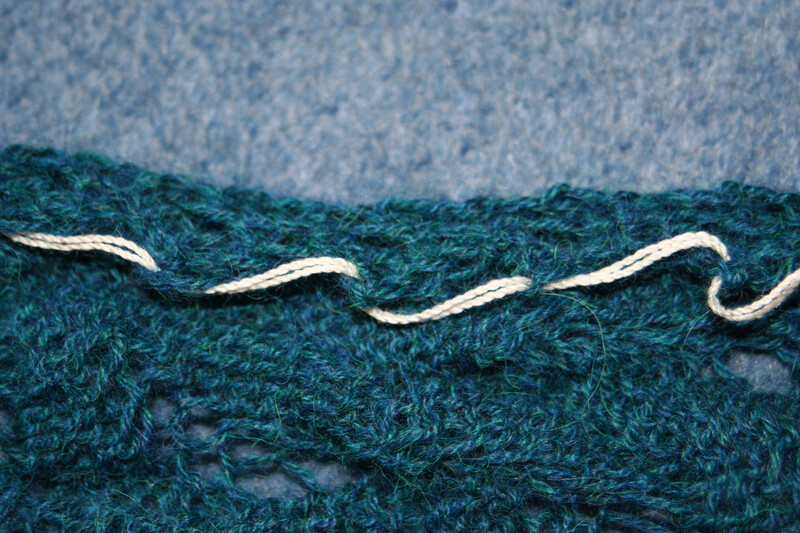 To close the slot: continue knitting the final row of the second side of the keyhole across all sts, knitting the two centre ones back together again (35sts). Then just keep knitting in pattern, as above. 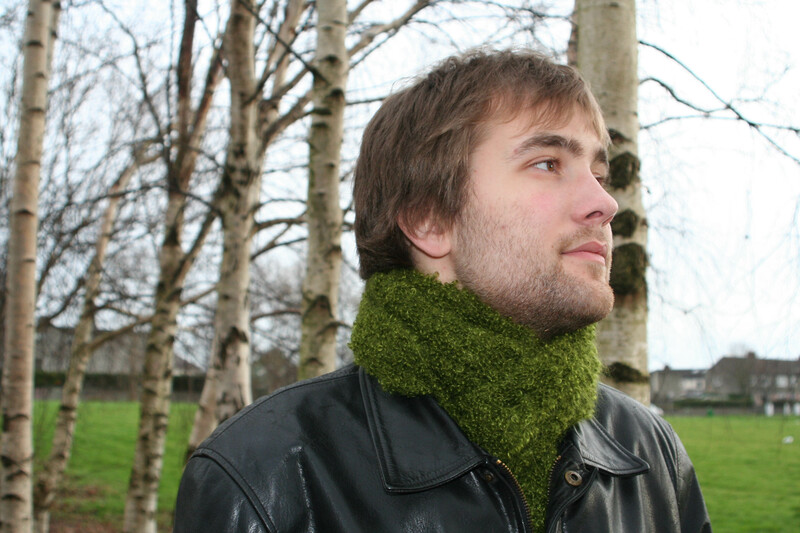 If you’d prefer a cowl, this will go twice around an adult’s neck, comfortably. 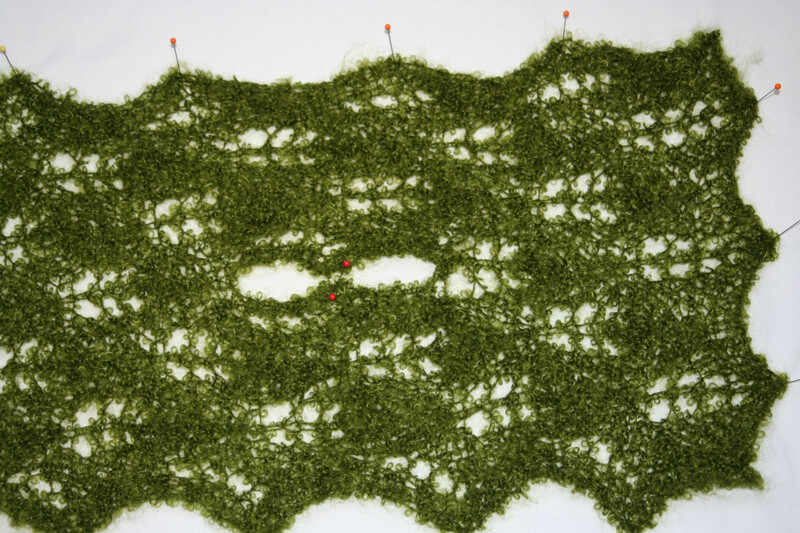 Just sew or knit the ends together, with or without a half-twist, whichever you prefer. I fell in love with these colours and their purity the year before last, and paid a visit to Cushendale, a family firm based in Kilkenny. 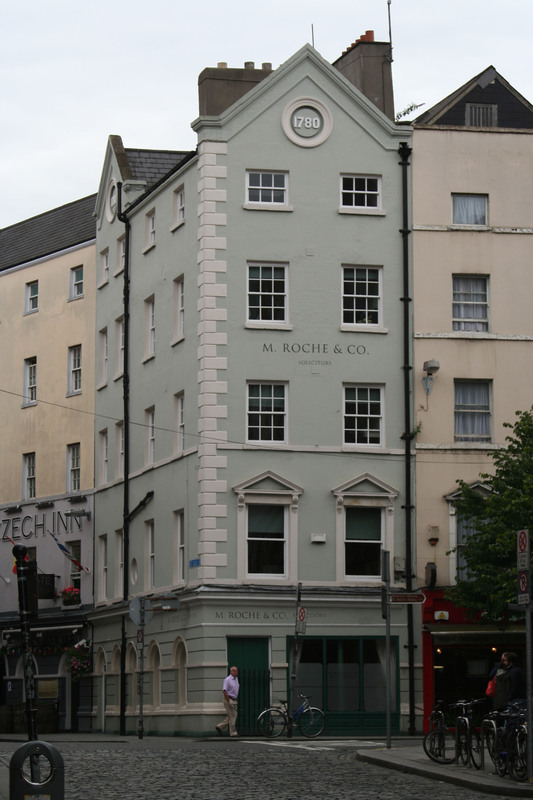 Their woollen mills is one of a rare few which still produce yarn from Irish sheep (although the mohair has to be imported). 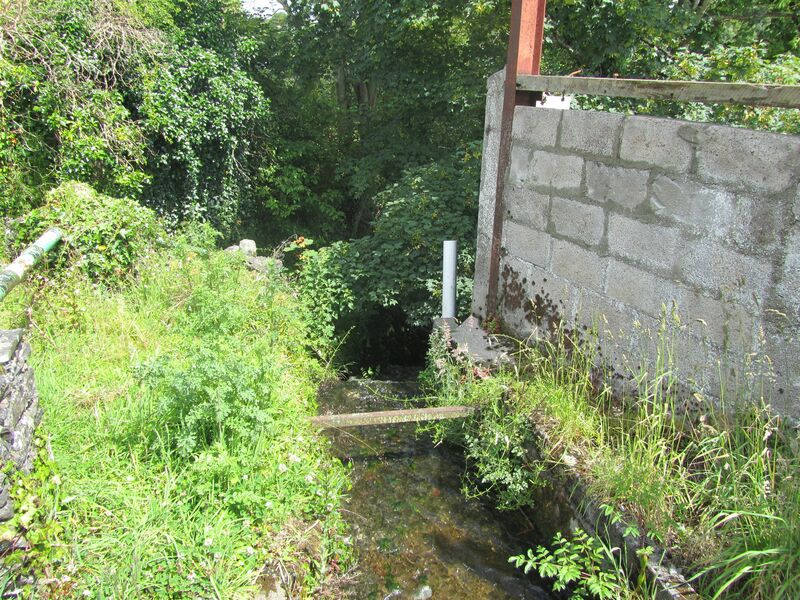 The intensity of the colours they produce can be attributed to the perfectly soft water flowing down off the mountains of Leinster Granite right through their mill, waters which have not been tainted by peat deposits either. 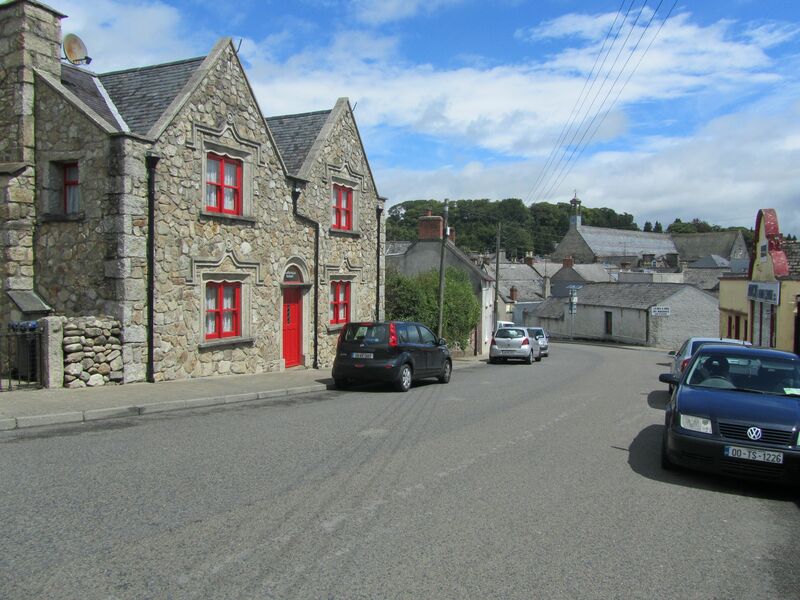 Cushendale Woolen Mills are in Graignamanagh, which translates roughly as Monastery Rock. 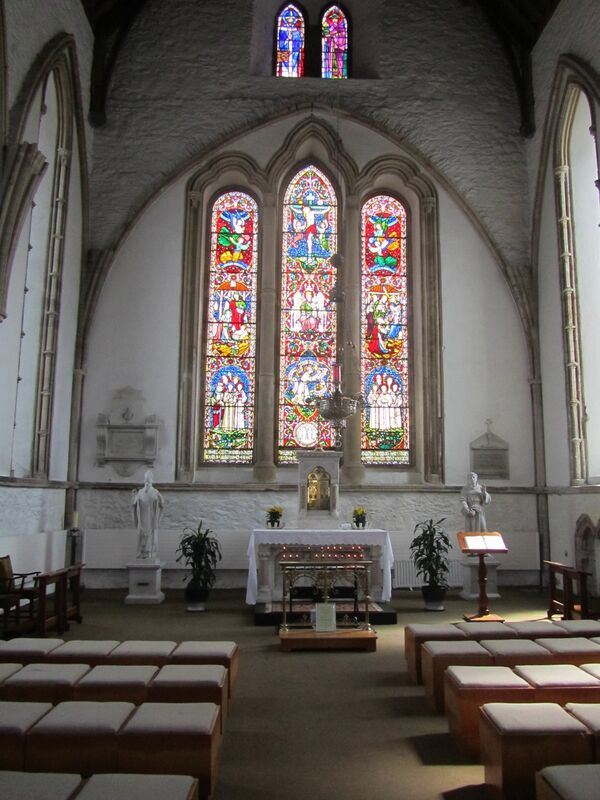 This is Duiske Abbey in the centre of town. 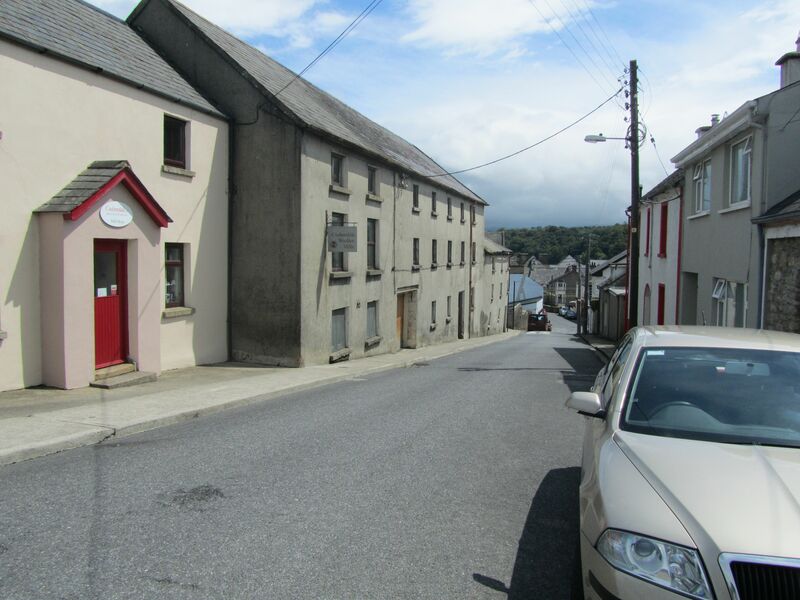 The streets are hilly, winding and narrow, for the most part, and I fell in love. When my DS builds the house he’s designing for me (i.e. shortly after we win the Lottery! ), I want him to put it here. This is the crystal-clear stream leaving the mill- as you know, I like to source my yarn from environmentally responsible producers! 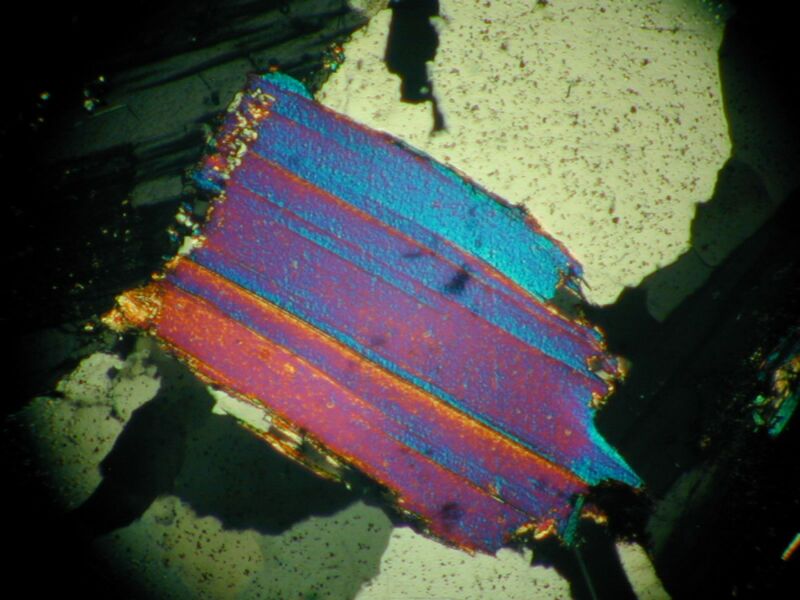 I couldn’t resist this one: it’s the aforementioned Leinster Granite under the microscope. 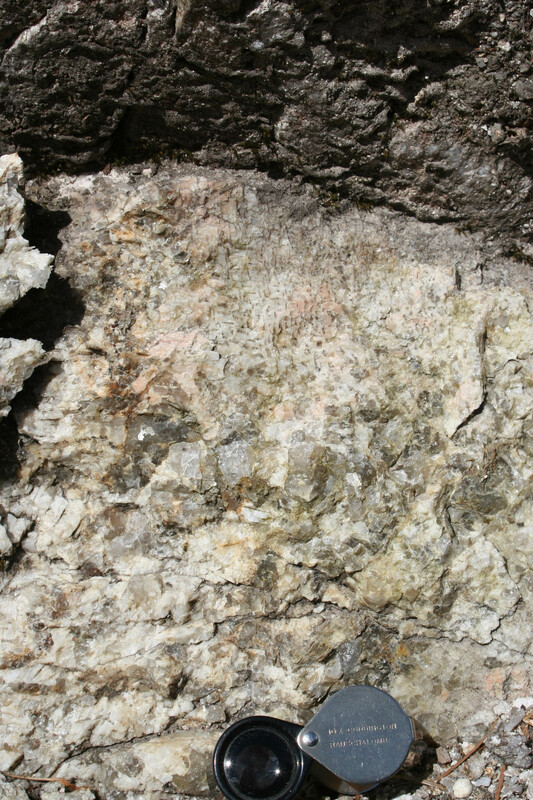 Quartz, feldspar (grey stripes) and mica (the colourful crystal in the centre). It’s a variety of mica called muscovite, which causes a silvery glitter in the rock and makes it such a popular building stone. 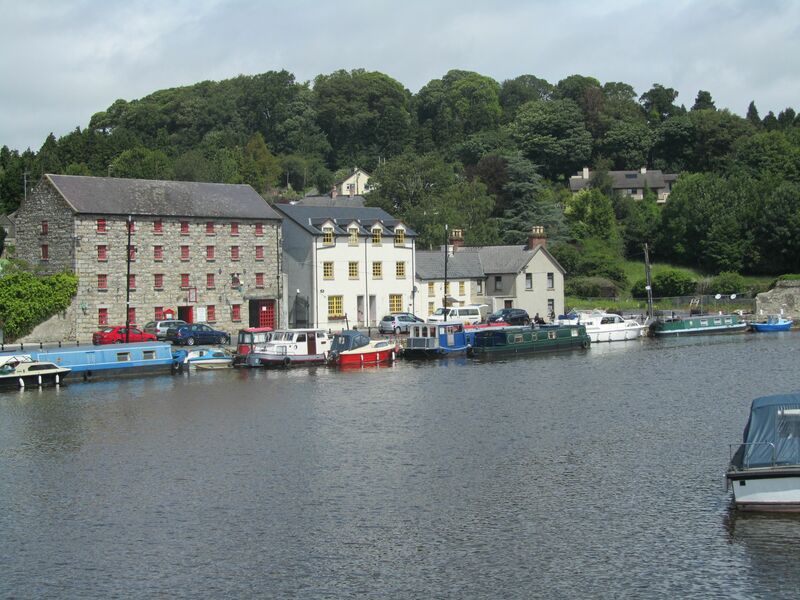 The river Barrow separates the older part of town, on the Kilkenny side, from the more modern part in County Carlow. 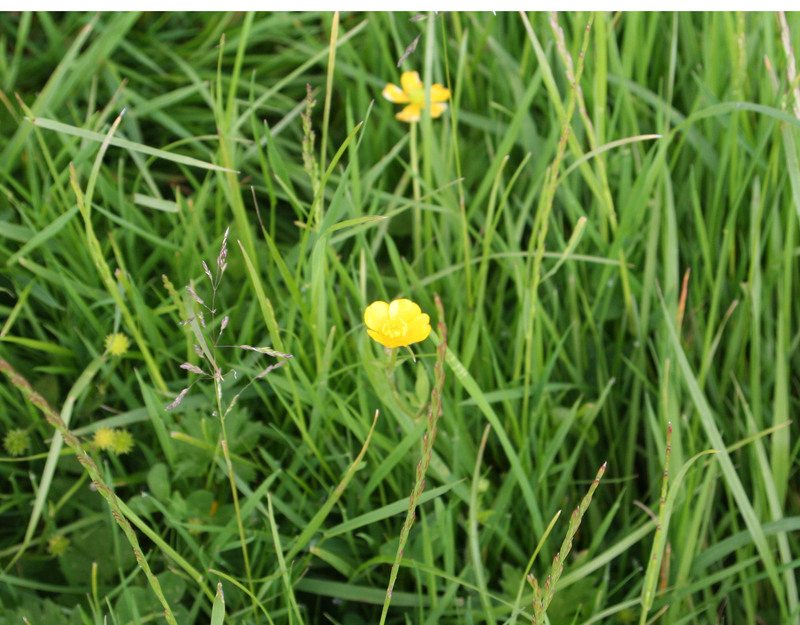 It is broad, beautiful and very popular, especially with bargees. This photo was taken just a hop, skip and jump away from a prize-winning seafood restaurant which deserves all the praise it gets- yummy! 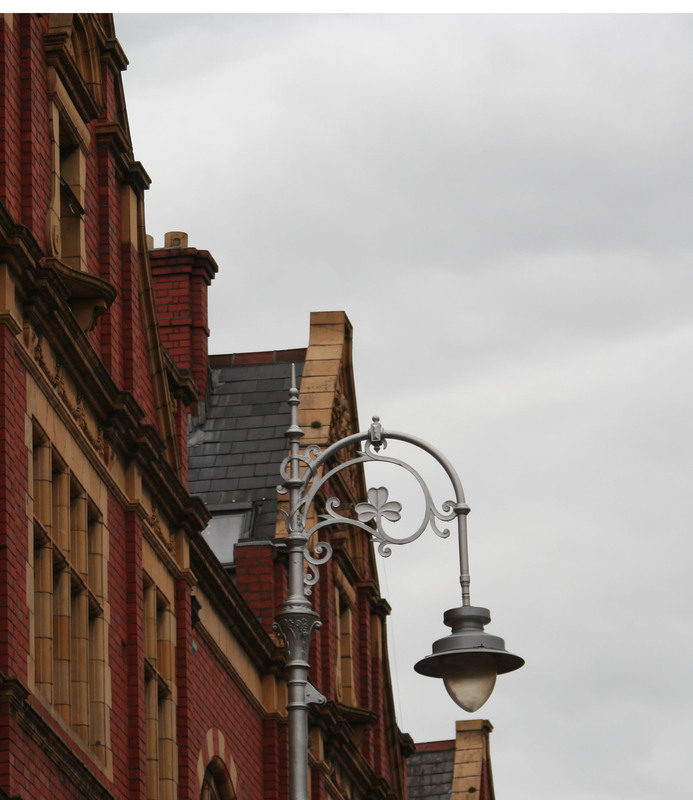 I really like this town…. I know, a bit too big for me, but no harm dreaming…. Meanwhile, back at the ranch it’s been busy. Apart from the ongoing saga of my back, it’s been interesting too. I started teaching at the school next door last Wednesday and boy, things have changed since my day! At this stage, I’ve plenty of experience teaching adults, and children one-on-one, too, but a roomful of 29 7-year-olds was a totally new adventure. I seem to remember spending a lot of schooltime in terrified silence at that age, thanks to the nuns (there was a particularly virulent strain at my old school- there is a reason I sent my son to a mixed, secular school!). But nowadays the classroom seems to be a much more lively place, which is great, but the noise level will take some getting used to on my part. I find the class size horrendous- 29 small children, with a few doses of learning disabilities, ADHD and major sugar rushes thrown in…. But the class teacher is a dote, and enthusiastic about the knitting, so I’m looking forward to my next lesson, and to learning a lot about teaching such a lively bunch! I’m experimenting with an eyelet pattern in some of my yarn-diet hand-dyed silk from Oliver Twists, because I think an allover pattern would be too busy. I put on a pound or so over Xmas- immobility, mainly- so I was required by the terms of my agreement with myself to start using up my old stash until I got back on track (alright, I admit it, not much of a hardship, but it worked). I’ve now got a small pile of patches made from scraps of Donegal Tweed, because I find that stuff irresistible and have a rainbow of remnants. This is a very long-term project though, to be tended to when I’m in vegetable mode and need soothing. It occurs to me that the numbers of patches would directly reflect my stress levels, but counting them would be stressful and therefore counterproductive, so forget it. I’m just enjoying being back in contact, thanks again for all the kind wishes! And let me know if you have any problem with the pattern- good luck! There’s just no point waiting for a blue sky to show you some more of Dublin, and besides, this is a more realistic view of the city- nobody comes here for the weather! 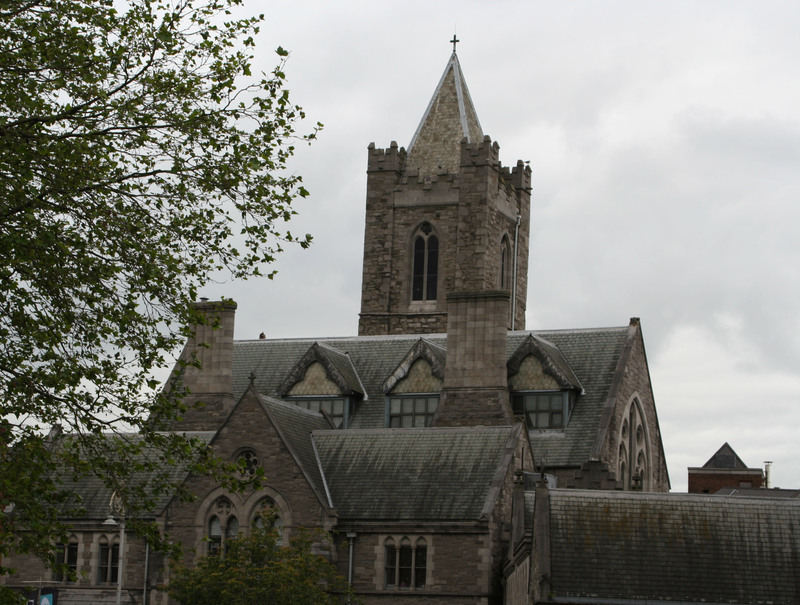 This is Christchurch Cathedral, originally founded c. 1030, although it has obviously been modified since. It’s relaxing, just to stop by and think of those 10 centuries of history right on this spot (even if you haven’t any knitting with you). 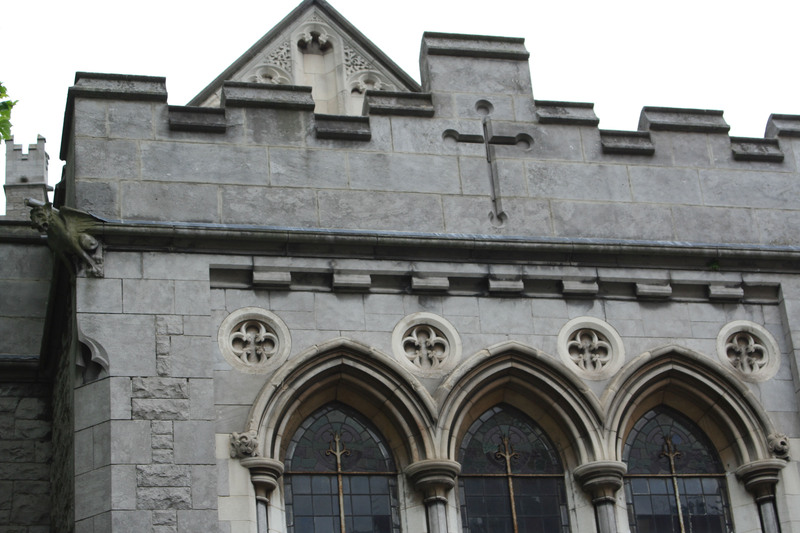 I particularly like the little gargoyles (e.g. centre left, above), they look as if they get a lot of job satisfaction from spitting on people. 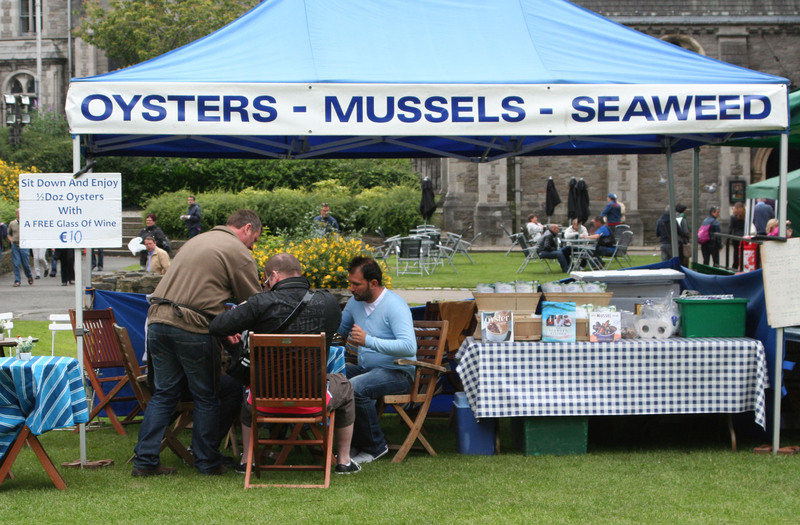 Saturdays (in season), market stalls are set up in the grounds and weary sightseers can partake of assorted local delicacies. If , however, like me you prefer not to swallow live animals whole, I suggest you head off down Dame St…..
….and away we go down Dame St., and left into Temple Bar, in search of wholefood that doesn’t wriggle. 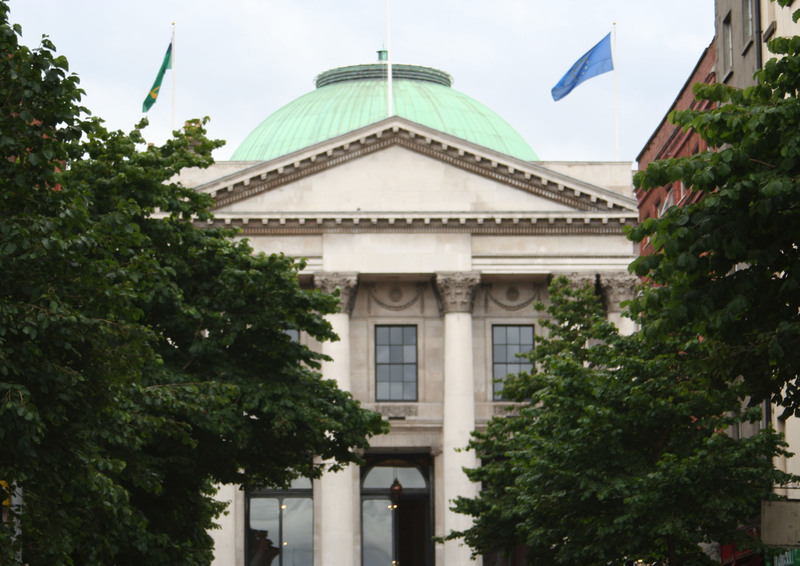 I couldn’t resist taking this photo of City Hall, with the European flag flying on the right, and the golden Harp of Ireland on a green background on the left. Yes, you’ll have to take my word for that, I know they’re not clear, but I’ll have you know this photo was taken at risk of life and limb, in the middle of Parliament St. traffic, and I had to promise my poor son not to give him any more grey hairs by trying for a second one. It was either that, or he’d have confiscated the camera. So, stop for a second and appreciate this once-in -a -lifetime photo, this is as good as it gets! 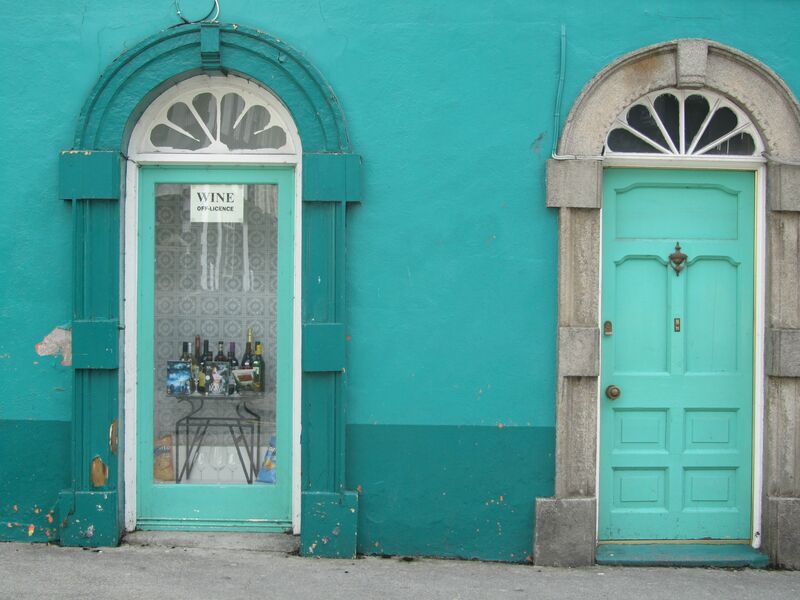 Here we are in the quiet back roads of Temple Bar, noting in passing the beautiful proportions of the Georgian shopfronts. I think a lot of those bicycles were parked here at the beginning of the cobblestones, because they are truly uncomfortable to cycle on (trust me on this). 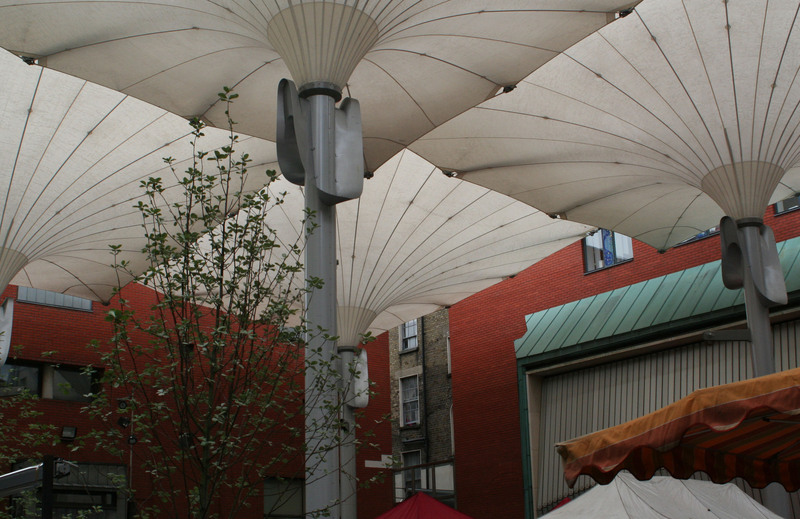 A few more steps, and we’re at Saturday’s Temple Bar Market, abounding in healthy snacks for all tastes, organic whatever-takes-your fancy, and designer crafts. It was so crowded I decided to leave it to your imagination and focus on the umbrellas over the umbrellas- which is a fair metaphor for the last few months/ years! It feels as if it’s been grey and rainy forever, and that is why this post is entitled Wanderlust- I’ve decided I just have to go travelling! Writing this blog and hearing from you people all over the world has underlined the fact that I haven’t been away by myself for over two decades (well, apart from work, geological conferences and such, and they don’t count). Mind you, wanting a holiday and affording one are two separate things, especially for a lone parent whose offspring has another four years to go at college. Still, the decision has been made, so the way will be found- I’ve got us this far! Ok, back to real life for the moment. 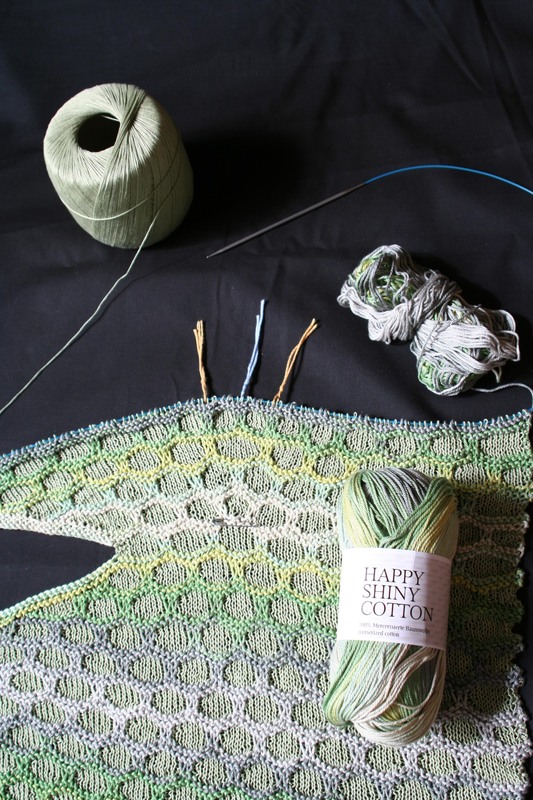 Most of my best ideas come to me while I’m knitting, and most of my Leafy Canopy shawl variation (original by Anniken Allis) was knit while my head was in Thailand (how’s that for budget travel?). I’ve had some queries about finishing or blocking shawls once they’re knit (or crocheted), so here’s a mini-tutorial for ye! 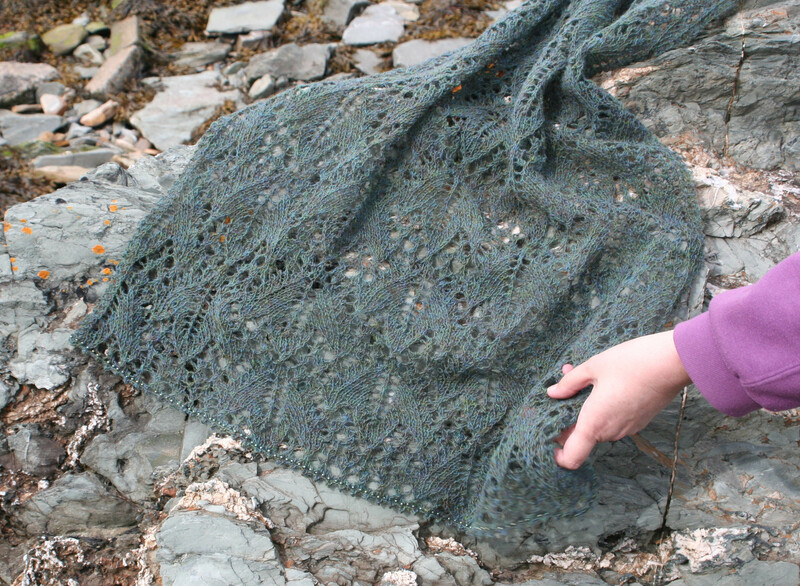 This shawl was knit from the bottom upwards, and before being finished looks misshapen: this is par for the course with lace shawls in particular, so don’t panic! 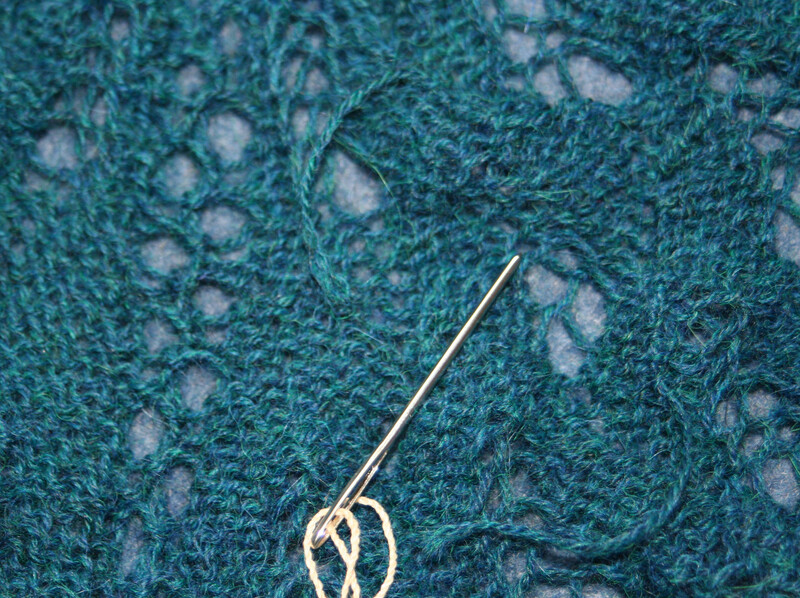 The top edge is composed of what were the two sides while it was being knit, and should form a straight line. 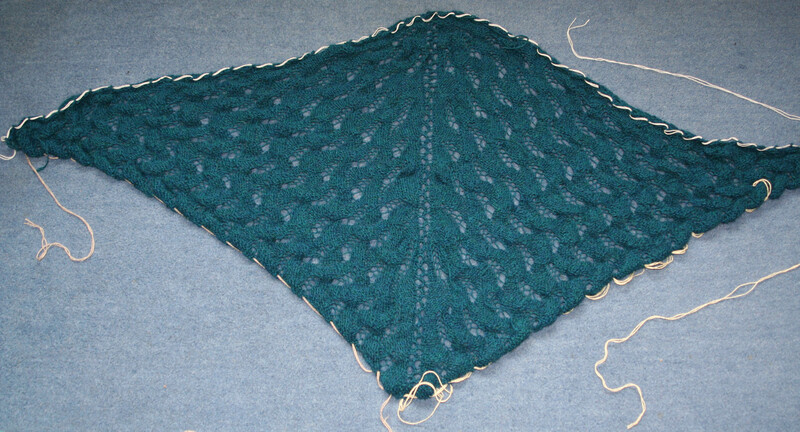 The shawl will be (gently!) pulled into shape after being washed,and held this way by nylon yarn/cords and lots of pins while it dries. Before washing (or more accurately soaking), the strong synthetic yarn or cord is threaded once through each pattern repeat (through the the same stitch, in the same direction, for best results). Each of the three sides of the triangle has its own separate cord. Note that there is only one cord at the top edge (see pet rock), even though it’s very bulgy at this stage. 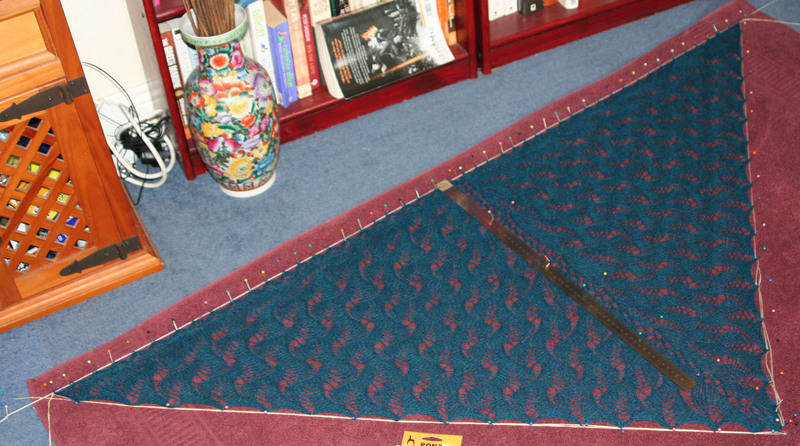 The spine of the shawls is almost as long as the ruler (60cm / 24 in.). Here you see two loose ends which have been woven in- don’t trim them now, but wait until the shawl has been stretched and dried, as they may well be pulled and shifted during the process. Now it’s time to soak the shawl (c. 20 min, cold water and a preparation such as Eucalan or Soak). If you forget the cords before you wet it, you can still put them in afterwards, but it may drive you demented….. Or you could leave the cords away entirely, but it’s very difficult to pin the project out evenly without them. Some people use blocking wires, but I’ve never really seen the point in investing in them, so I can’t help you there. The pins are actually pulling on the cord, so they are taking a lot of the strain off the stitches (this will be clearer when you are doing it yourself). By the way, I once invested in these extra-long and -strong quilting pins and never regretted it- they not only do the job really well but are also difficult to overlook, which is very important if you’re using somebody’s bed as a blocking board and don’t want to lose their friendship! 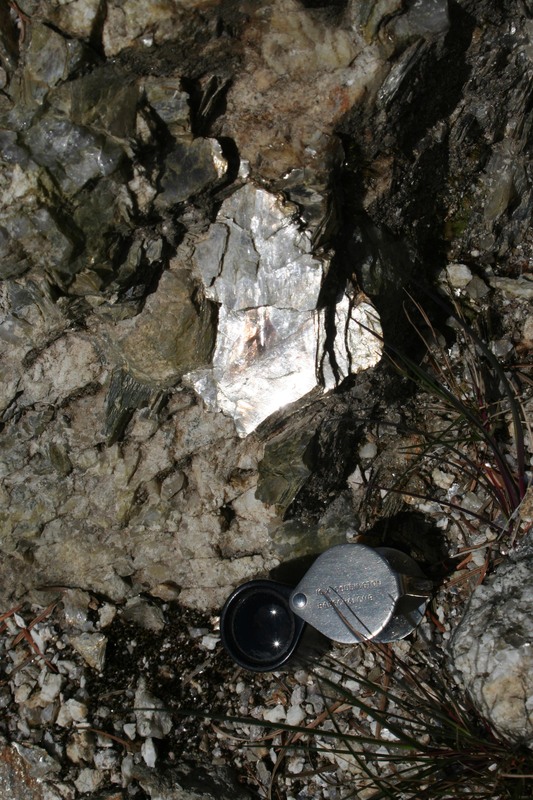 By the way, this is Angelina the Andesite. 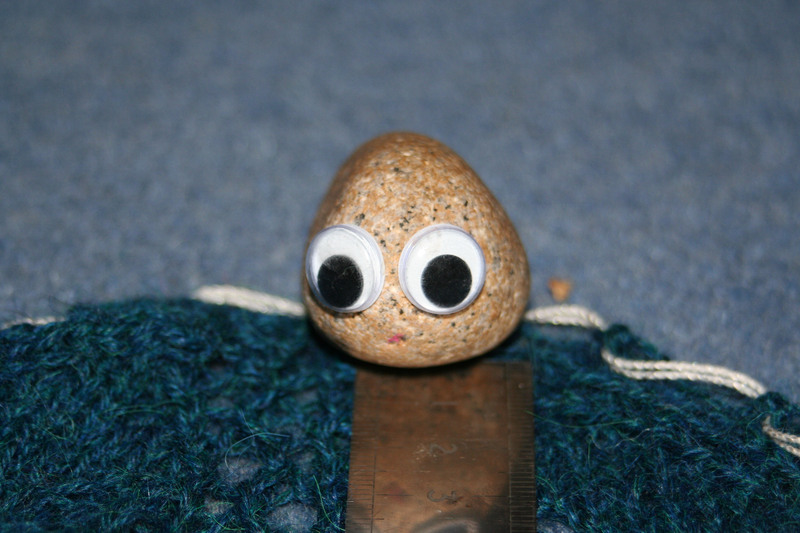 Now, I know it’s completely naff for a structural geologist to have a pet rock (as opposed to a truck-load of specimens), but, in my own defense, she was given to me…. To rationalise further, she’s not just any pebble, she was originally part of the riebeckite-granite which makes up the island of Ailsa Craig, off the west coast of Scotland. 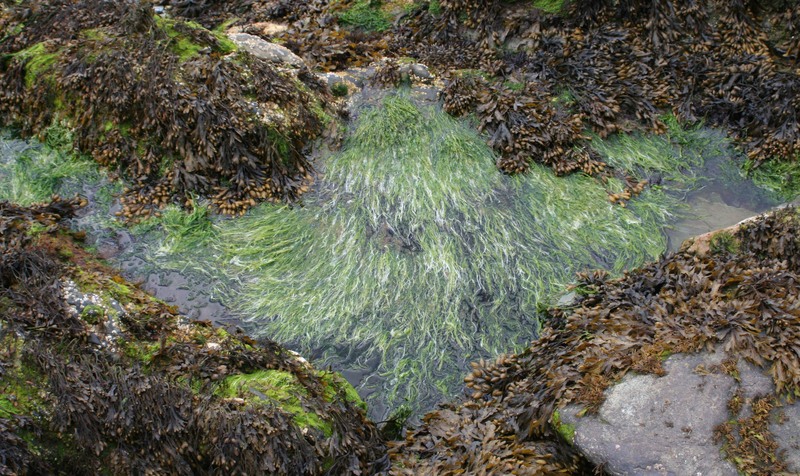 She hitched a lift with a passing glacier and was deposited near the eastern shore of Ireland when the ice melted. Subsequent millenia of turbulent adventures in the storms and waves of the Irish Sea knocked the sharp edges off her, transforming her into the smooth and elegant entity who now resides with me. So there! And if Angelina can be so adventurous, then why shouldn’t I? Excuse me, I’ve got to go and raid my piggybank…. The virus is gone, the cotton wool between my ears has reverted to functional brain cells, and I can think straight, thank goodness. Mind you, now Darragh’s come down with it, and it’s his turn to be thrun on the couch under a heap of afghans and shawls, of which there is of course no shortage in this household. It’s autumn, alright! Thanks to my dopey state, all I’ve been able to knit recently is the Curve of Pursuit throw by Pat Ashworth that I started last week, it’s been a great comfort, especially as it now keeps my legs nice and warm while I knit. I’ve been making quite a few mistakes, but it’s easy enough to catch and reverse them early on, without stressing out the invalid i.e. me. It’s a perfect design for a convalescent with the fidgets! So, for want of knitting adventures to share (but tune in next week, I’m bursting with ideas now! 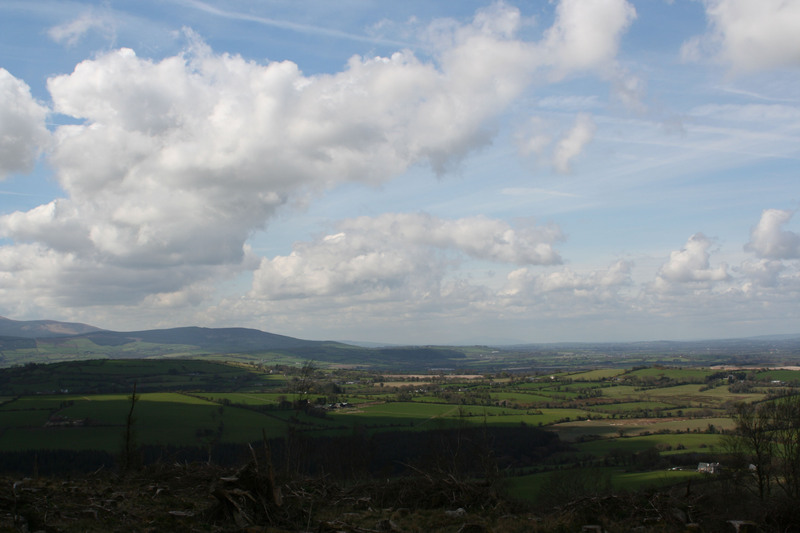 ), you are cordially invited to Clogher Head, to the north of Dublin, for some fresh air, and just a little bit of geology. 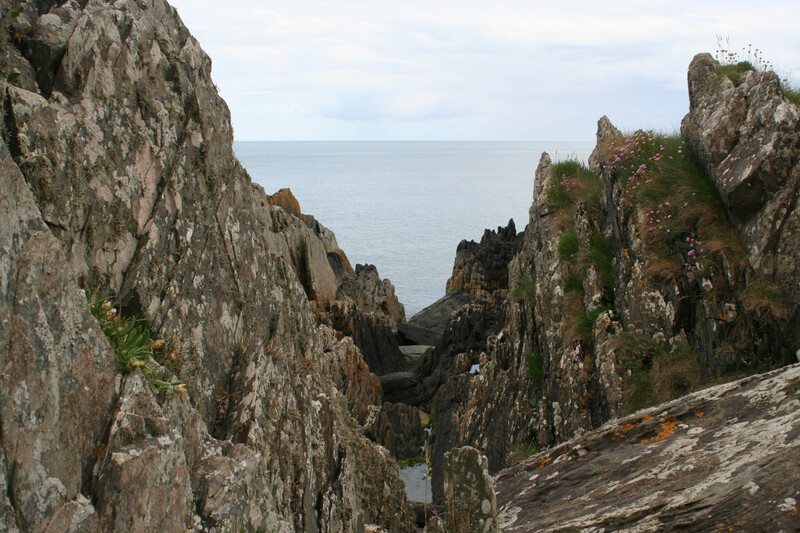 Clogher Head is a rocky promontory which is very geologically significant: it is thought to be part of the suture zone between two continental plates which collided when the Iapetus Ocean closed. 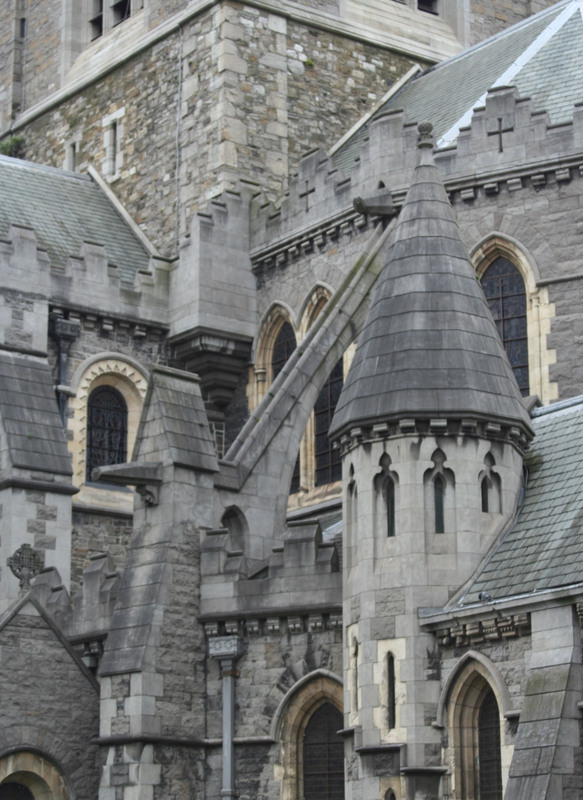 Before this happened, the NW part of Ireland was connected to Newfoundland, and the SE half to what is now Europe. 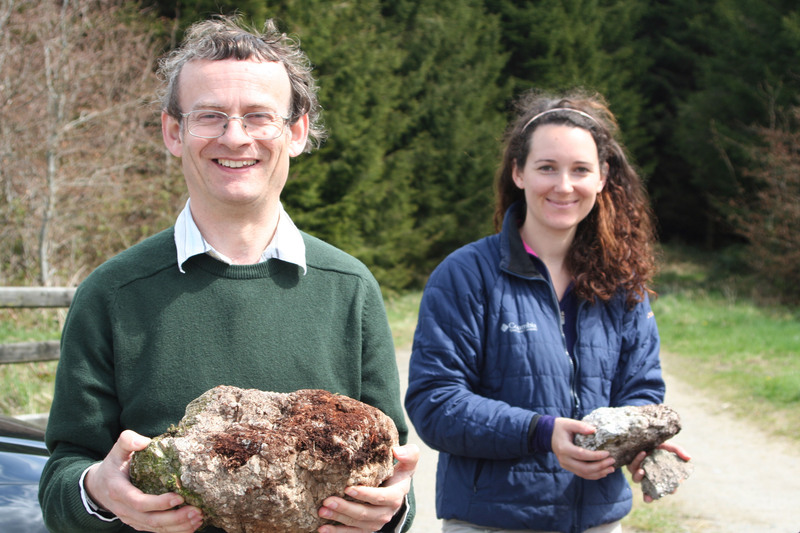 These rocks used to be Iapetus ocean floor sediments which got squashed in the middle. A long time later the Atlantic Ocean opened up as the North American and Eurasian plates started to move apart (and are still doing so today). Had enough science? I try to remember that not everyone is as inspired by rocks as I am, honest, but I admit that I have been known to get carried away (just ask my long-suffering son!). 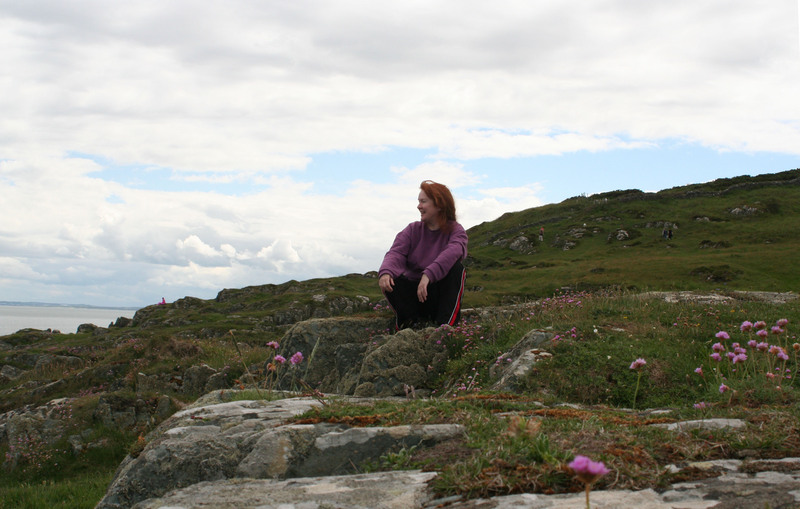 These outcrops, for example, tone in with my projects because the people at Cushendales’ choose their colour palette from their natural environment, which is one of the reasons I love their yarns. By the way, please note that I have my son to thank for a lot of these photos, there’s a lot of teamwork involved in the photographic part of my posts, ‘cos he’s my teacher when it comes to publishing the pics, even when I take them myself. These rocks have a turbulent history, despite their calming colour. This one even looks like lace to me: after being compressed it was also sheared, opening up regular arrays of cracks (FYI: these are called en echelon tension gashes, if anyone wants to look them up…). This is a good way to get ideas, I find. 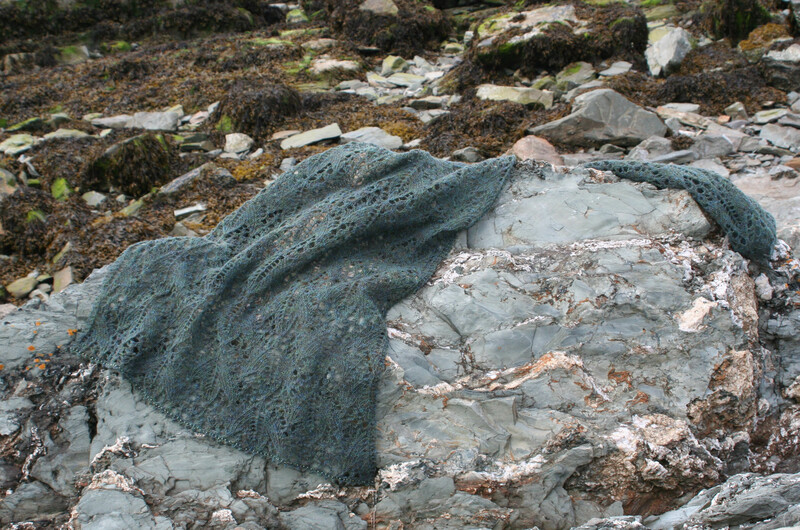 Here I can see a shawl in green silk, and a textured scarf in brown and gold. 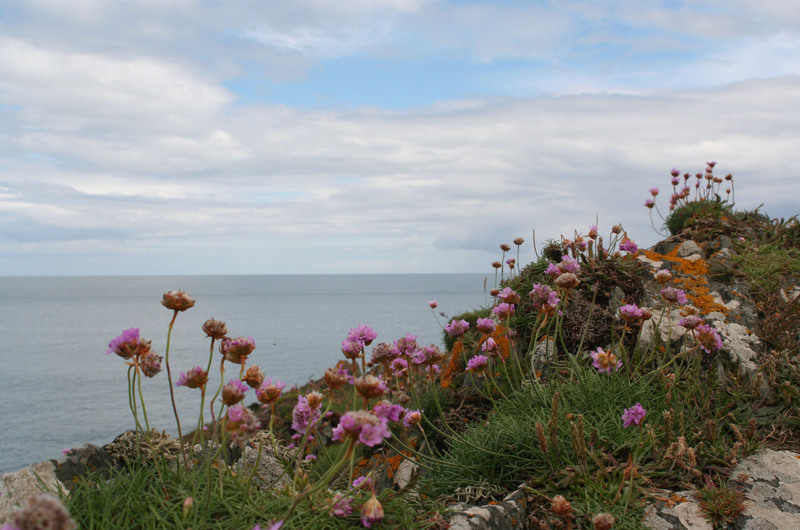 Time to say au revoir to the Irish Sea for now, and the last of the rock roses for this year. As a new blogger, and one who is not at all social media-savvy, it means a lot to receive such support, and I am thrilled. I get a real kick out of hearing from people all over the world, and discovering how much we have in common (and I don’t mean just knitting!). www.aoibheni.com/blog.htm Aoibhe is the only crochet designer who can tempt me away from my knitting needles, because her designs are gorgeous. Her posts are practical and great fun to read, and she has been a huge help to me in getting started here. Thanks, Aoibhe! knitlab.wordpress.com Kieran Foley posts loads of marvellous photos which I find inspiring, and I love his designs (knitting), too, because he combines colours and curves in a particularly sensuous way…. 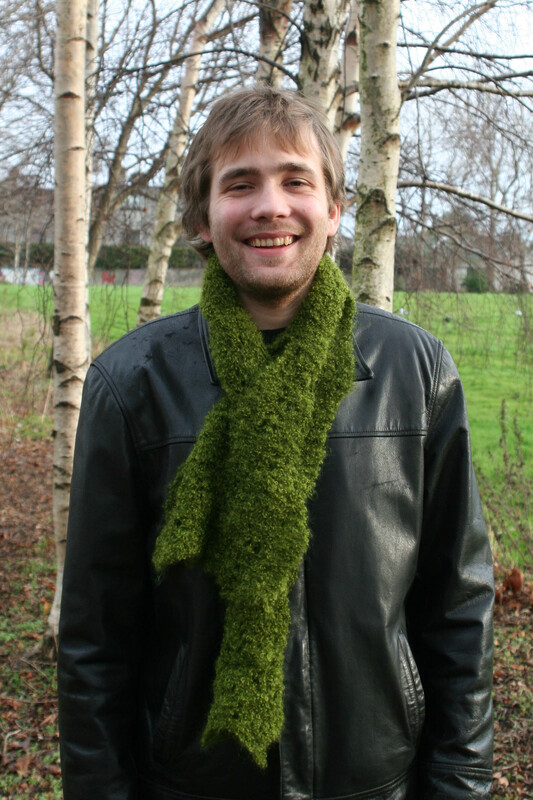 By the way, both Aoibhe and Kieran are on Ravelry, as well. 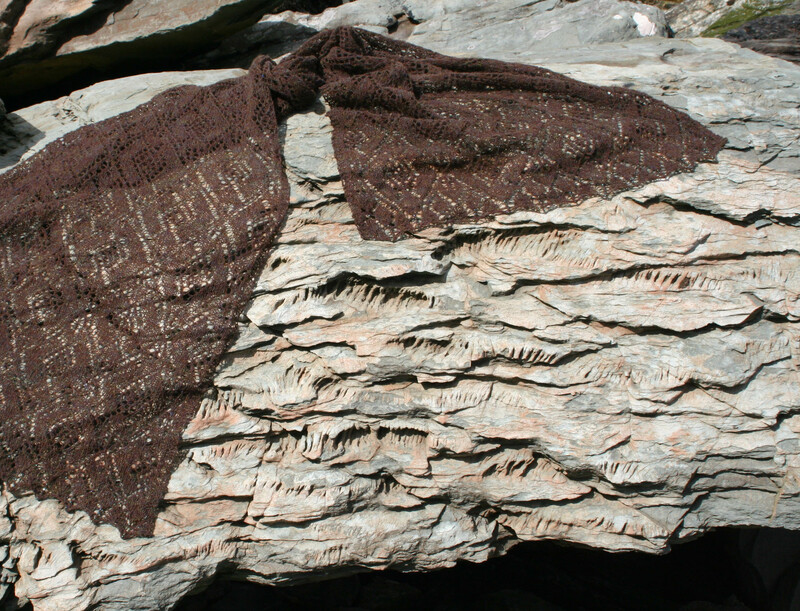 katedaviesdesigns.com Kate posts great photos of Scotland and writes beautifully on many aspects of the history of knitting- addictive! And her designs are legend. malcolmscorner.wordpress.com I recently “met” Malcolm and am enjoying the series of short essays in his archives, which cover a wide range of topics which provide me with plenty of food for thought about life, the universe and everything, while I’m knitting up the straightforward bits. The last time I did that was 4 years ago, and I’m raring to go again. 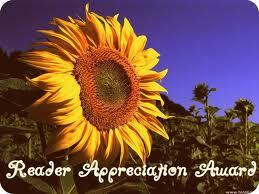 I am the proud Mammy of The Best Son in The World TM!